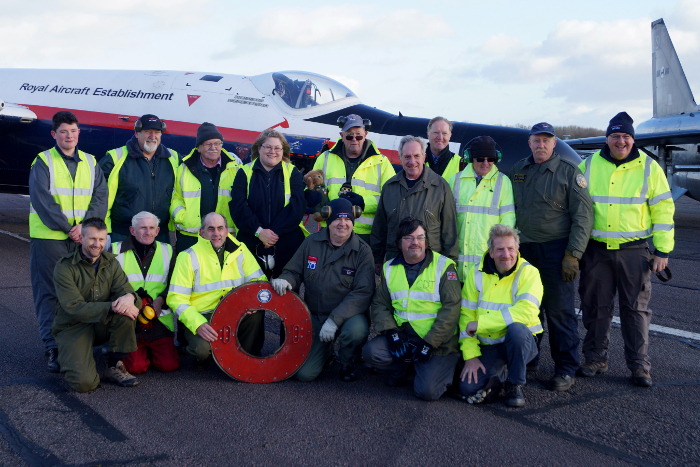 Buccaneer and ground crew. 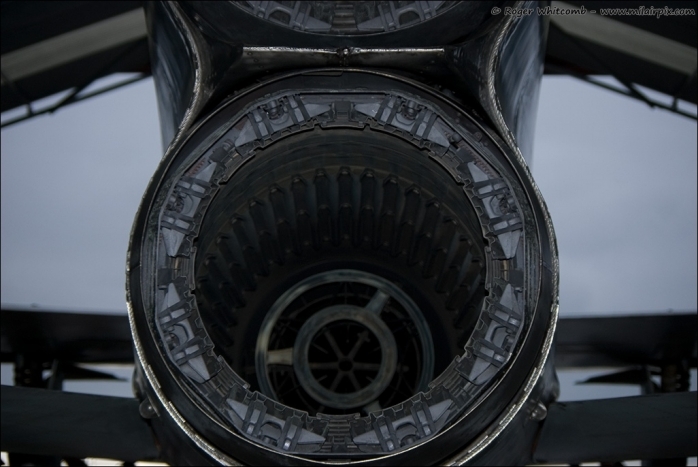 Photo by Chris Cannon. 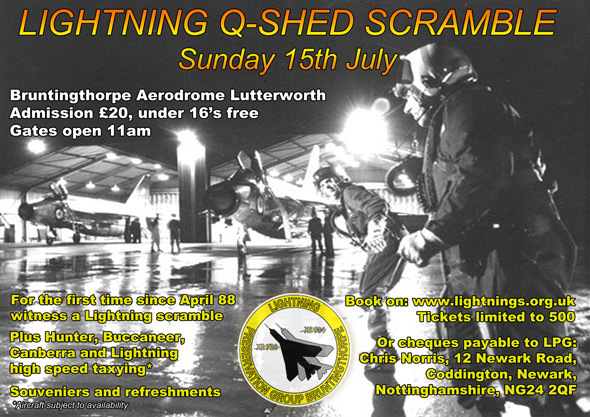 Situated in Lutterworth, Leicestershire. 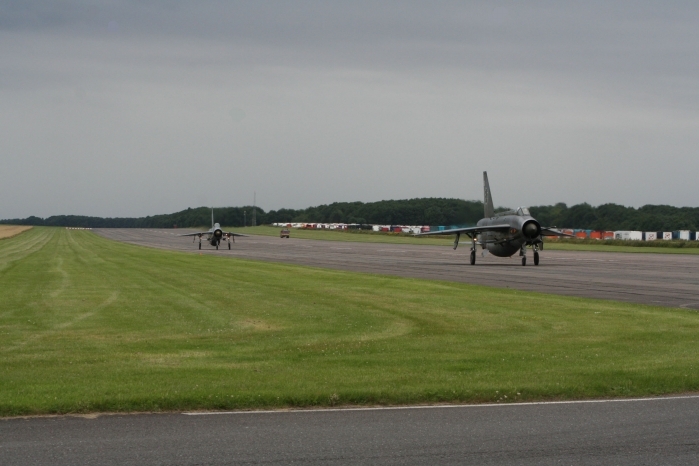 Bruntingthorpe has one of the country's longest runways and was an American airbase during World War II. 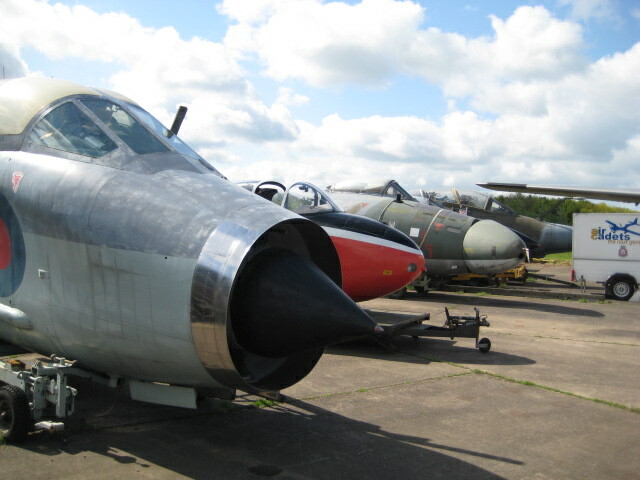 It is the home of a unique collection of mostly classic jets. 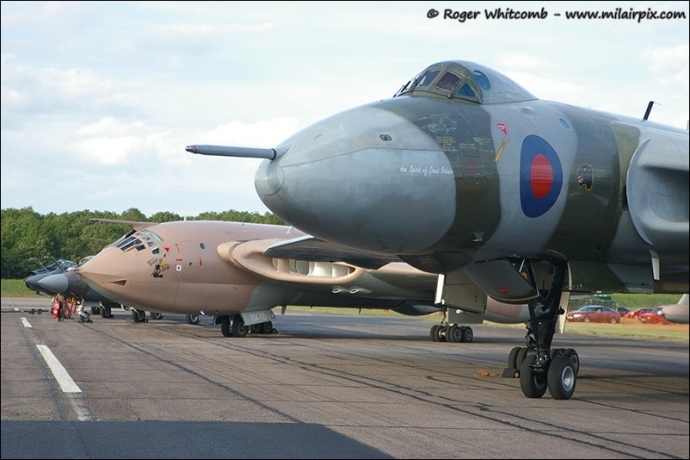 Ranging from a Victor tanker, the world's only airworthy Avro Vulcan, a Comet, a pair of Lightning F-6s housed in their QRA Shed as well as Jet Provosts, Buccaneers, Hunters and a Sea Vixen to name a few. 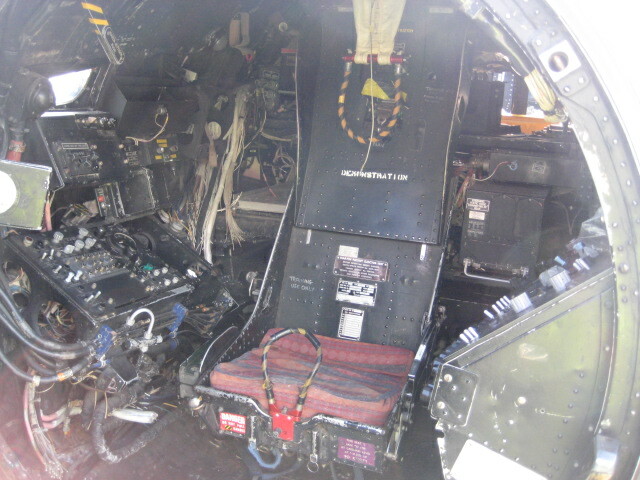 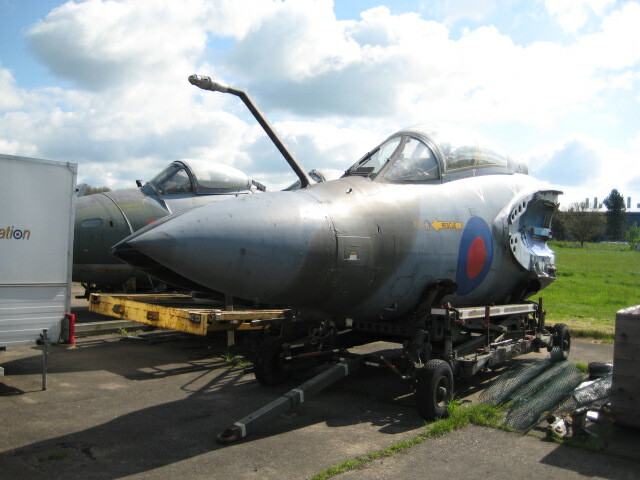 Bruntingthorpe also has a large collection of aircraft cockpits. 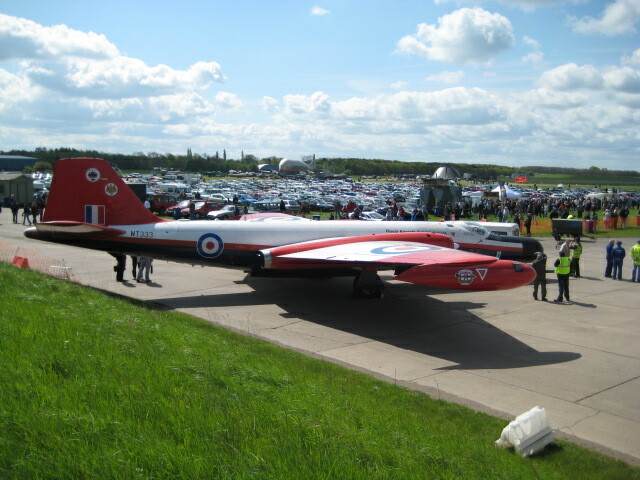 One of Bruntingthrope’s more colourful residents, English Electric Canberra B(I)8/B.6 Mod WT333 ‘Treble Three’, recently celebrated the anniversary of ‘her’ maiden flight with a fast taxi down the Leicestershire airfields runway- 60 years to the day English Electric’s chief production test pilot Desmond de Villiers lifted the jet from the aviation giant’s Samlesbury airfield. 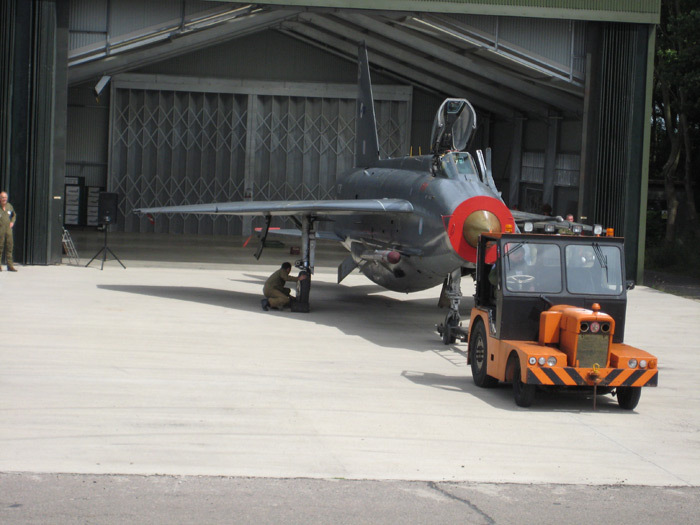 Not many could have guessed that the same machine would still be around more than a half century later – let alone recognise it! 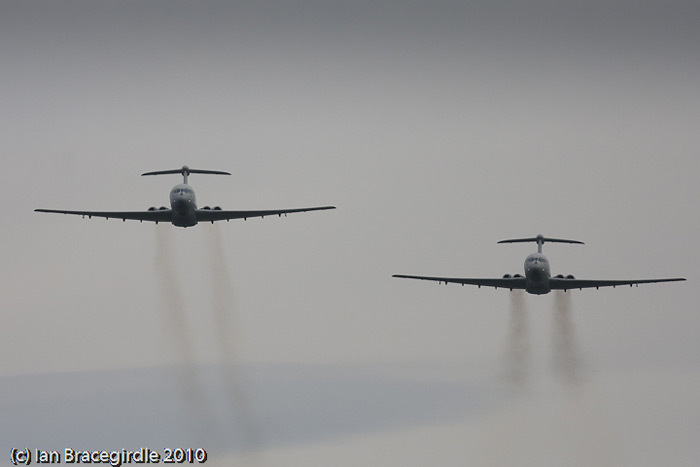 – as WT333 powered into the cold, Lancashire skies that January day in 1956.With such a significant anniversary, the team behind the jets – better known as ‘Treble Three’ - planned a small event for invited guests to mark it in the best way possible – a fast taxi run! 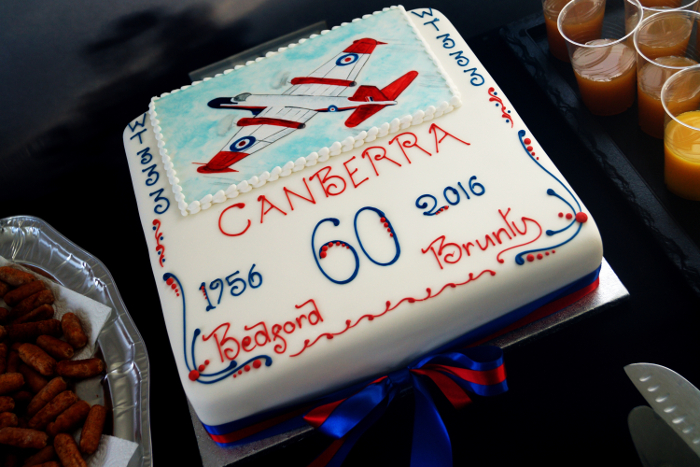 Joining the guests were members of Wing Commander Roland Prosper ‘Bee’ Beamont’s family – the very man who flew the prototype Canberra for the first time on May 13, 1949. 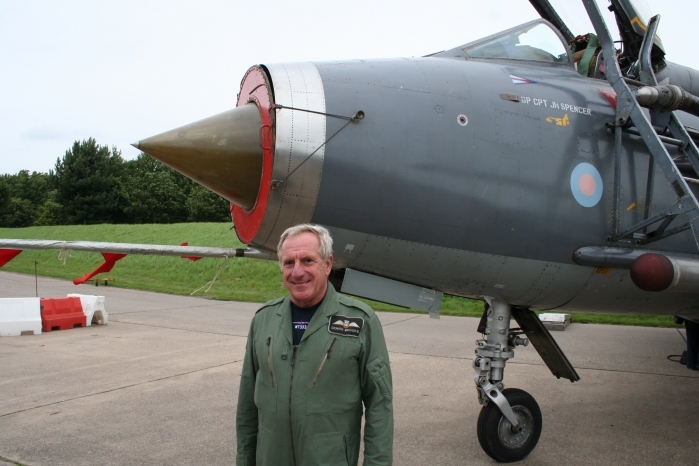 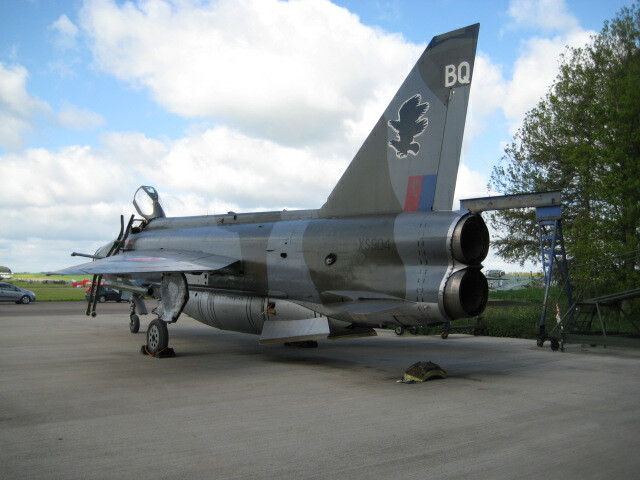 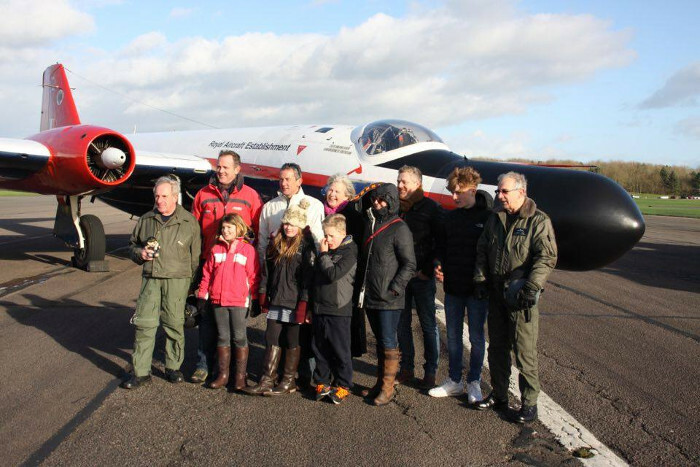 Other guests included a number of ex-aircrew who had flown WT333 and a couple of ex-RAE technicians and design staff who had worked on the jet throughout its operational history. 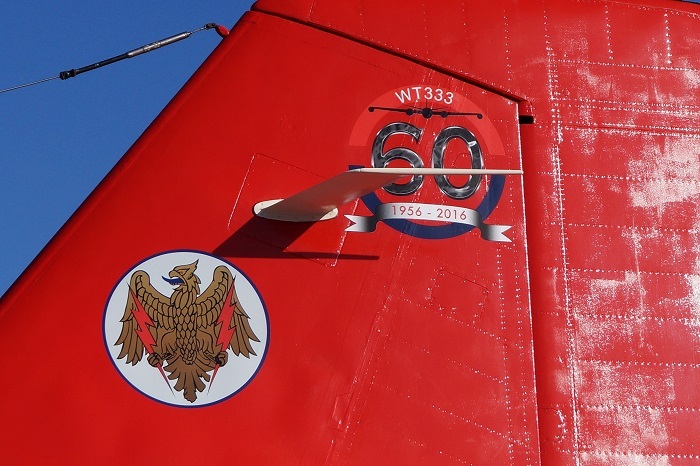 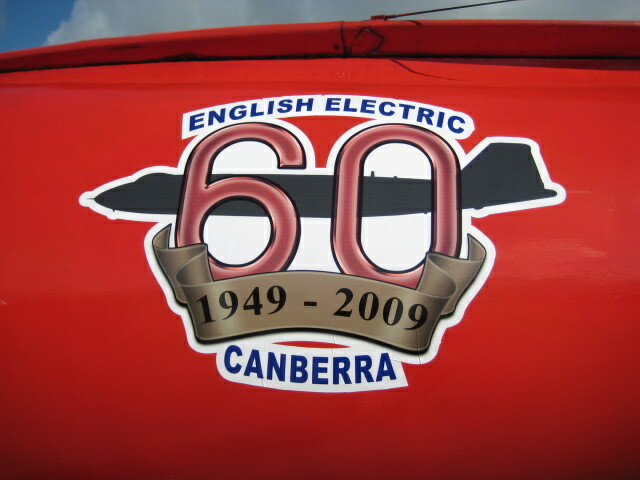 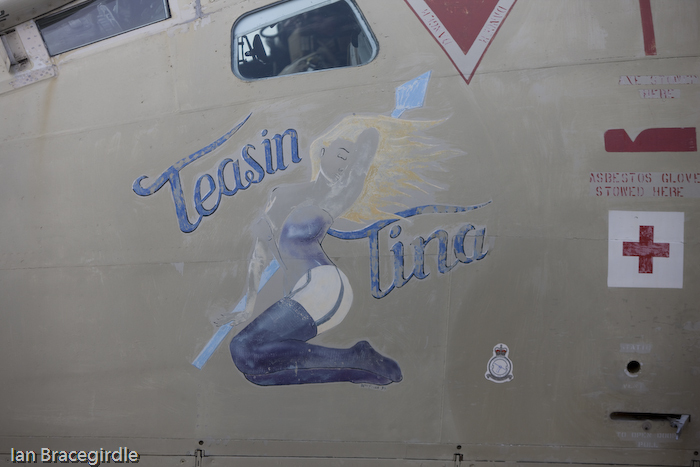 To help mark the event Spencer Trickett of Skytoons Aviation art was commissioned to design an anniversary logo that was applied to the aircraft’s tail. 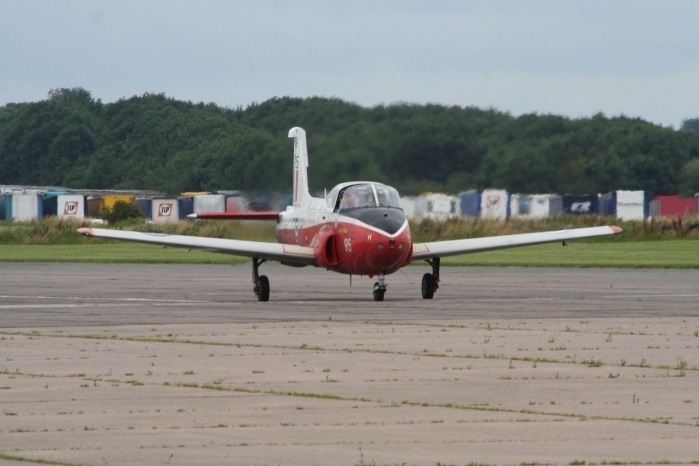 Following the jet down the taxiway and onto the runway it was very poignant to see a member of the team pat the starboard wing tank in similar fashion to that of a jockey would his stead before 'the big race'. 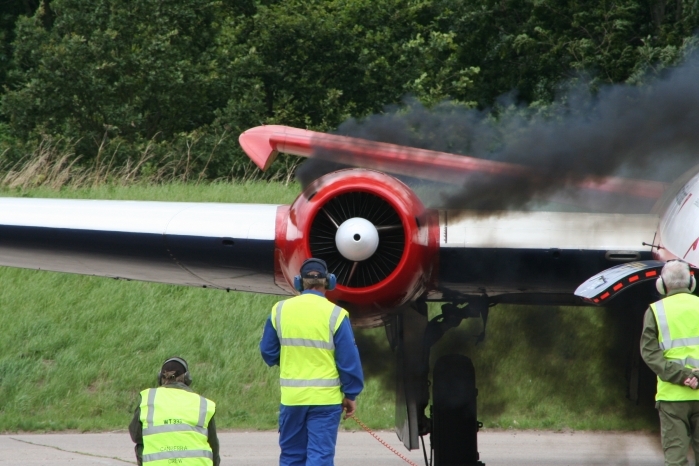 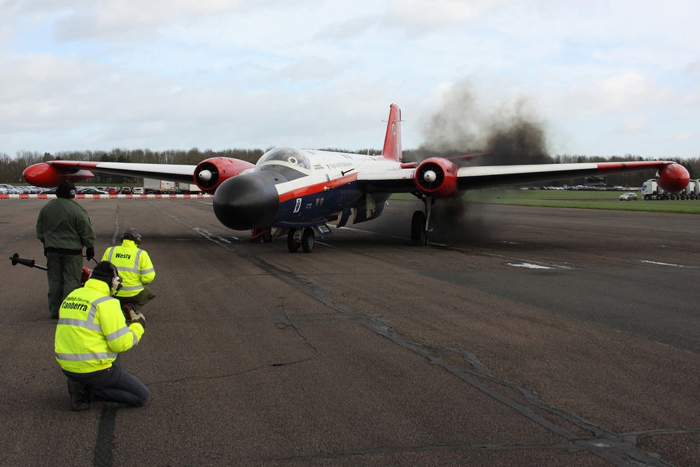 With the jet parked into wind and the ground crew in position, it was time for WT333’s party piece – the cartridge start – something that is both visually and audibly impressive! 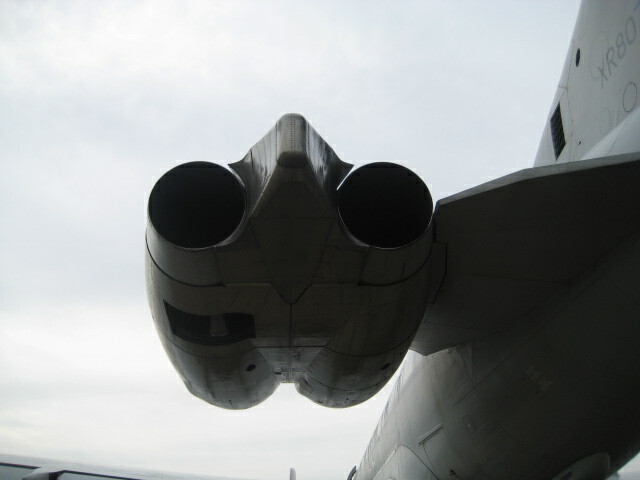 Before long, a brief silence was soon pierced by a shrieking whoosh as the port engine suddenly spat out a trident of black cartridge smoke. 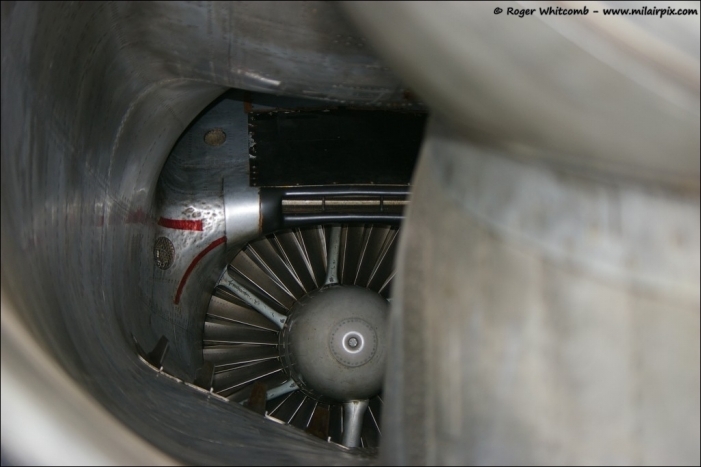 After a couple of seconds, the deep roaring boom of the first Rolls Royce Avon winding up filled the air as a sea of heat haze rose into it. 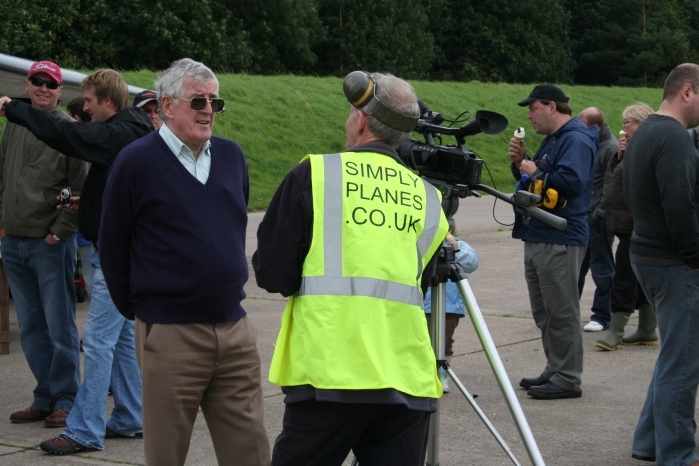 Repeated with the starboard engine, Crew Chief Clive Davies was on hand to help Alastair Walton and George Walton - 'Bee's' Grandson and Great Grandson – climb aboard with the day’s taxi pilot, Dennis Brooks, for the run from the ‘back office’. 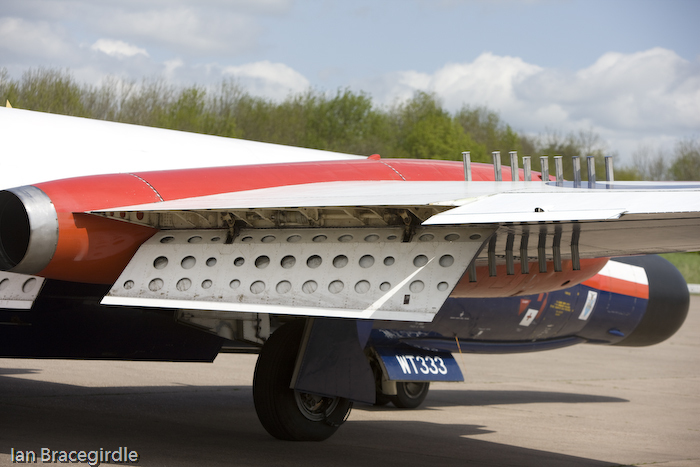 It was somewhat fitting that once lined up for the fast taxi WT333’s nose was pointing straight towards Lutterworth while being accompanied by a symphony of jet noise – the very place Frank Whittle spent many years developing the jet engine! 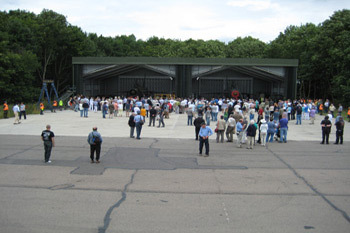 In fact, Bruntingthorpe was used extensively by the ‘the father of the jet engine’ during the development work, which without, the very jet being celebrated would quite probably have never existed! 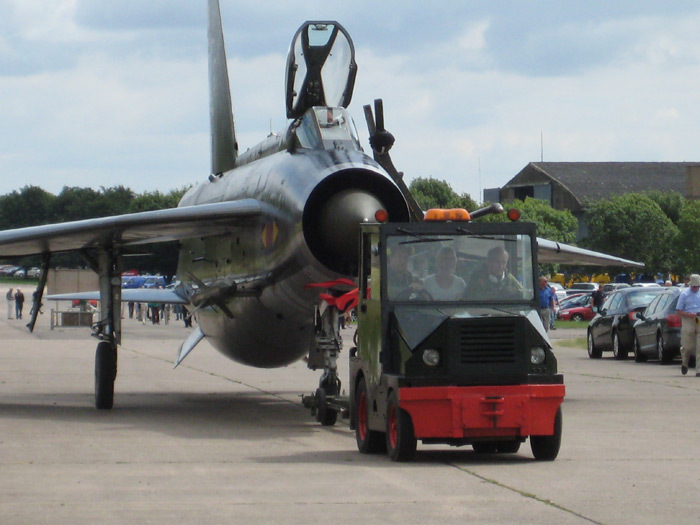 To say the machine leapt off the line is a huge understatement! 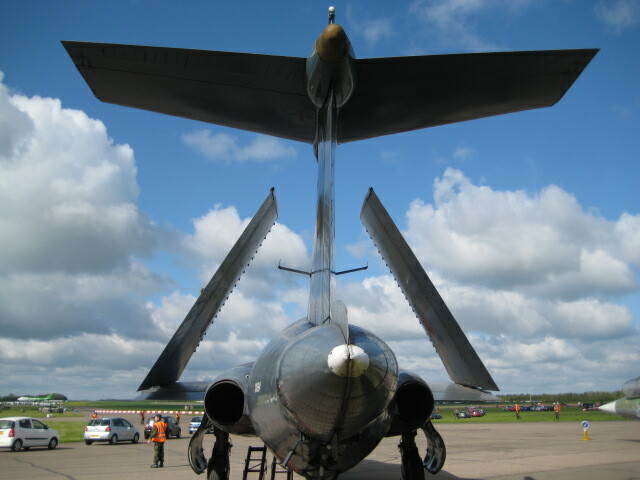 Fighting a rather gusty crosswind, it was incredible to see the jet suddenly rear up on the main wheels for just few seconds and show off a huge amount of ‘topside’ as the nose pointed into the sky – an emotional moment for the ‘Bee’s’ family knowing he was the man to do it first 66 years ago! 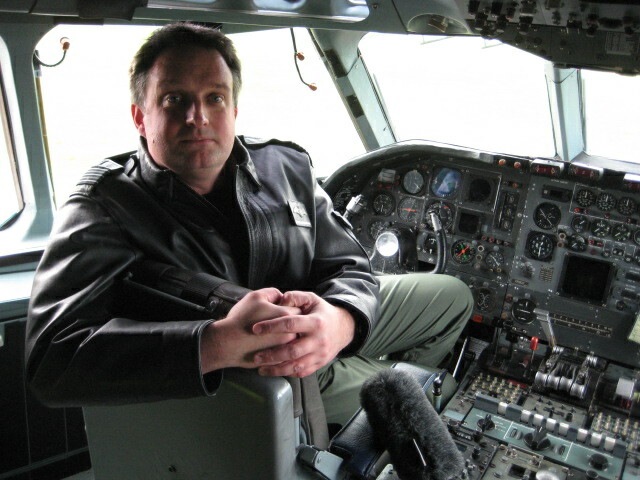 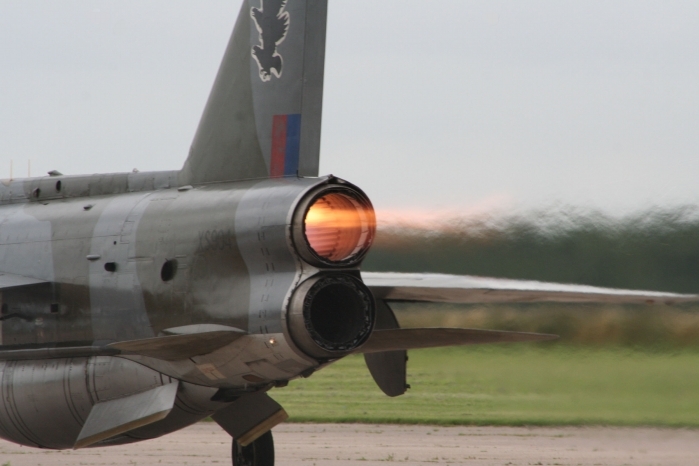 Dropping back down onto terra firma, the jet was suddenly quiet as Dennis ‘chopped’ the power and rolled out. 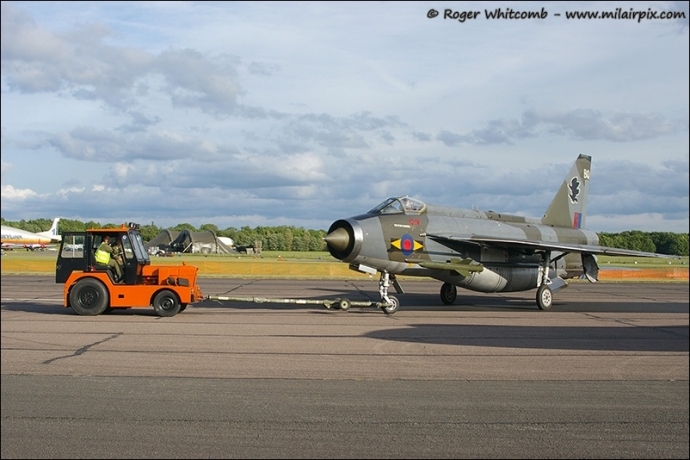 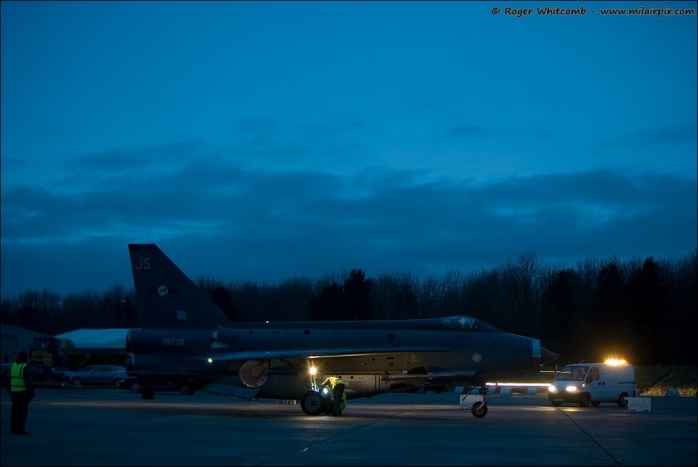 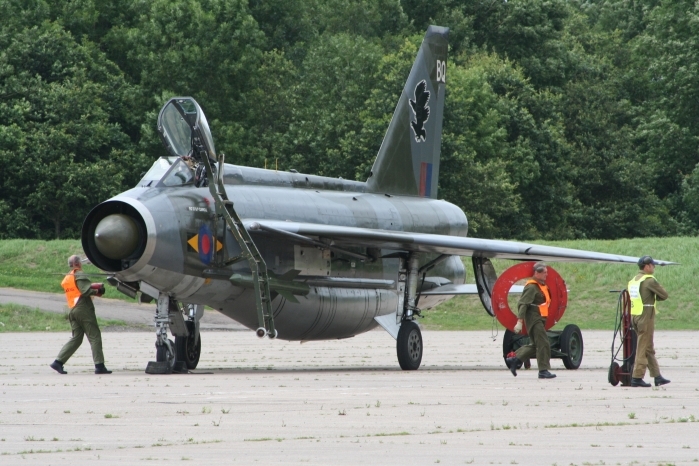 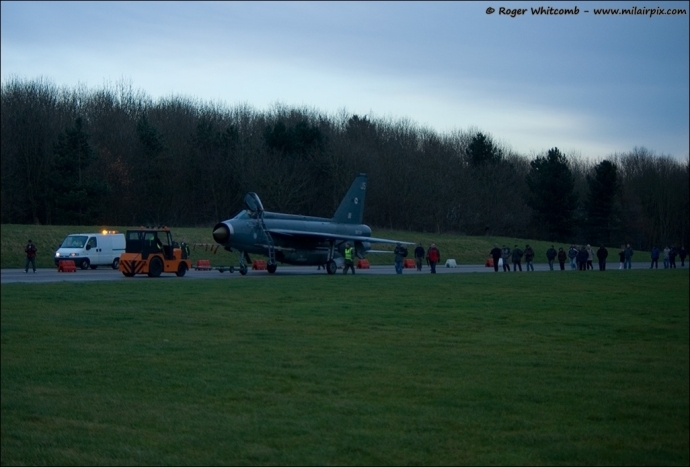 Back tracking to her awaiting crowd, many of those gathered couldn’t have failed to notice another British aviation icon being towed towards the runway – English Electric Lightning F.6 XR728/JS of the Lightning Preservation Group (LPG). 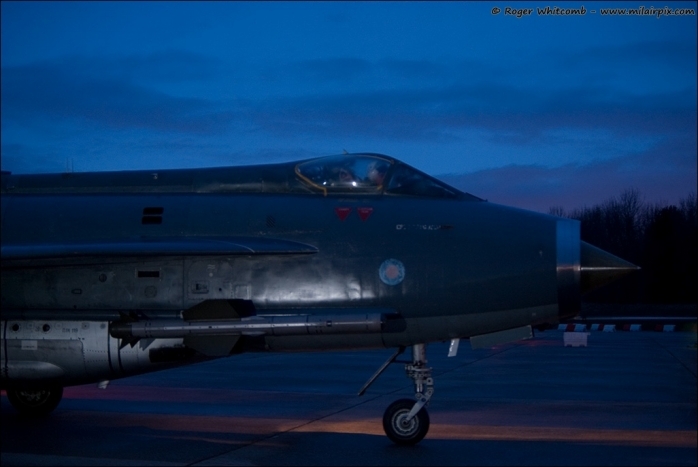 Making it a truly English Electric affair, the LPG carried out both a static run – including lighting both ‘burners – and a brief fast taxi in the capable hands of John Ward. 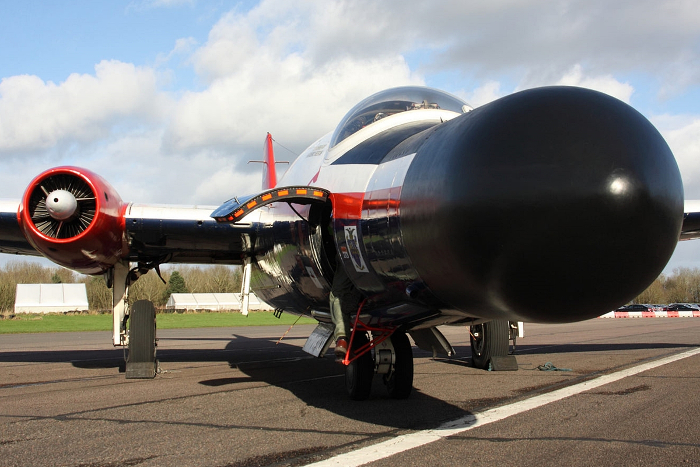 It is always a pleasure to see this once guardian of the UK’s skies come to life and roar again - unlike many of their stablemates that have sadly been reduced to mere memories and nostalgic pictures. 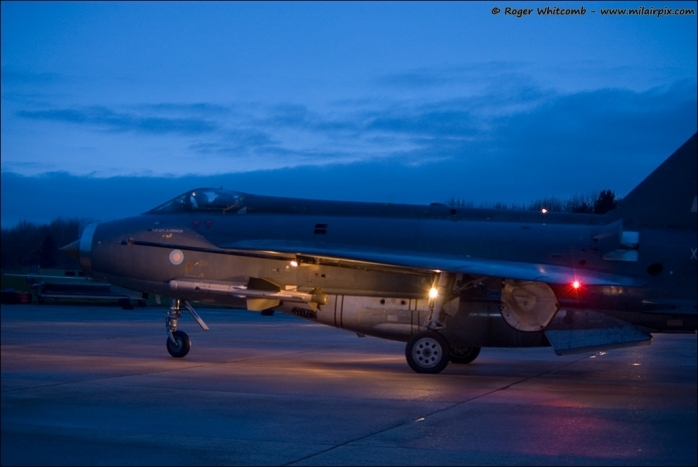 Incredibly, the Lightning and the Canberra were both the brainchild of W.E.W ‘Teddy’ Petter and Roland Beamont flew both prototypes for the first time as well as going on to fly the initial test programmes for each. 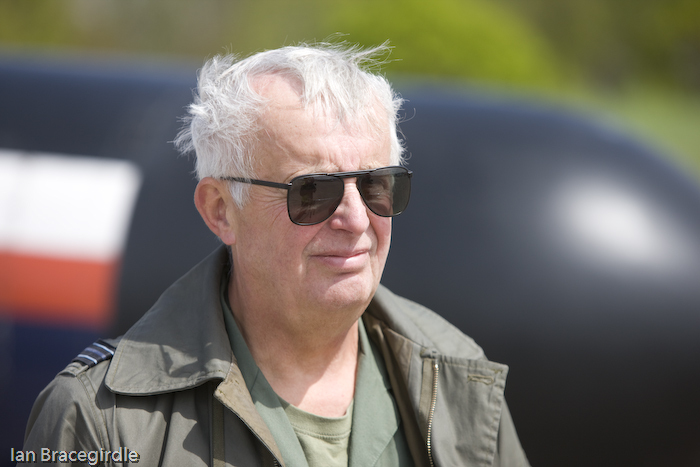 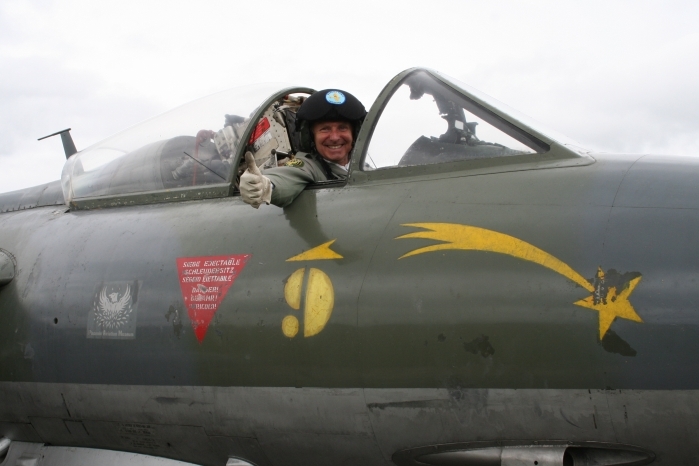 Amazingly, the very same man flew both WT333 and XR728 during their very first flights from the same runway albeit it eleven years apart – the late, famed test pilot Desmond de Villiers! 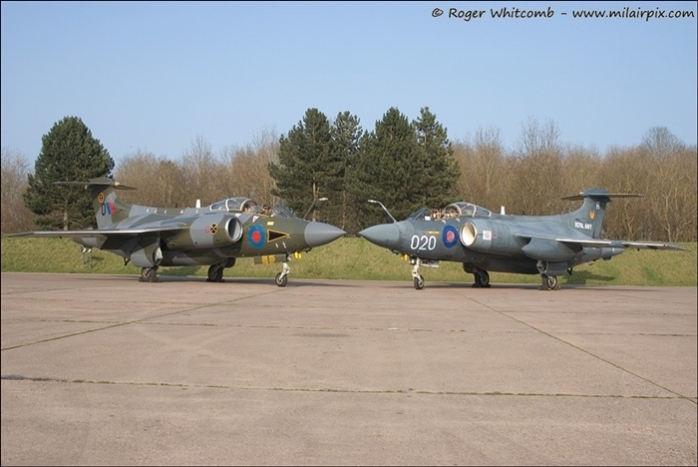 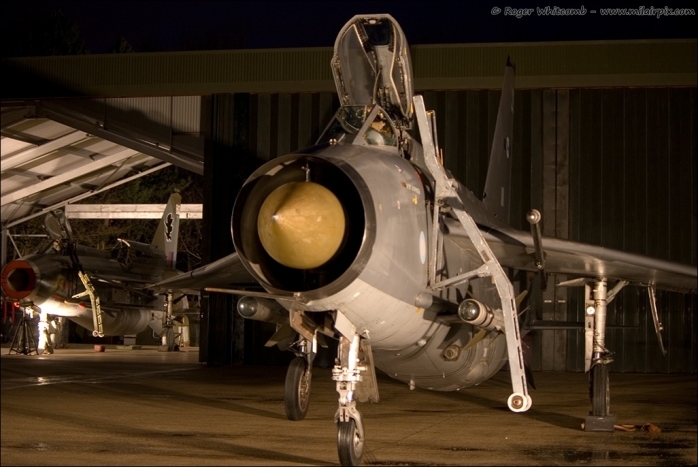 As both ‘Treble Three’ and XR728 sat next to one another for a photoshoot with both crews and ‘Bee’s’ family, it was quite clear to see the radical departures from the tried and tested designs of the time that the Lightning used. 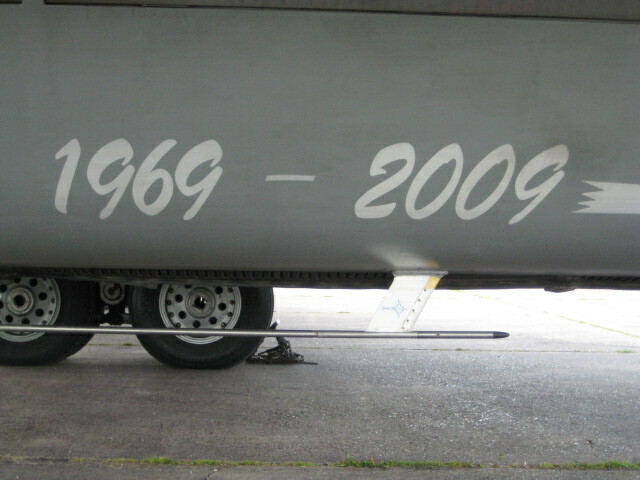 Who knows, maybe we will see the 70th anniversary in 2026! 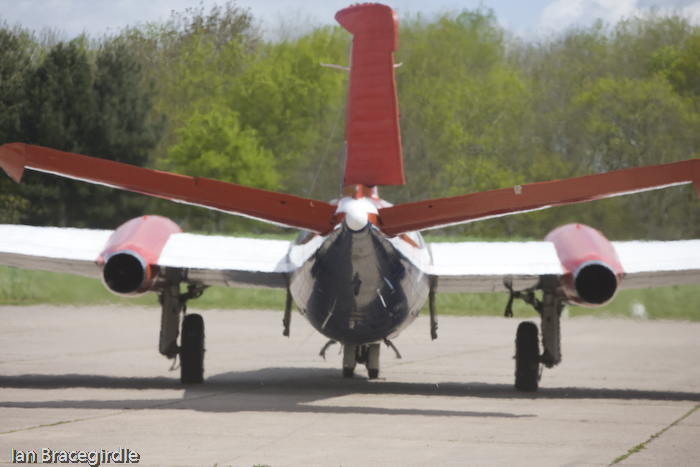 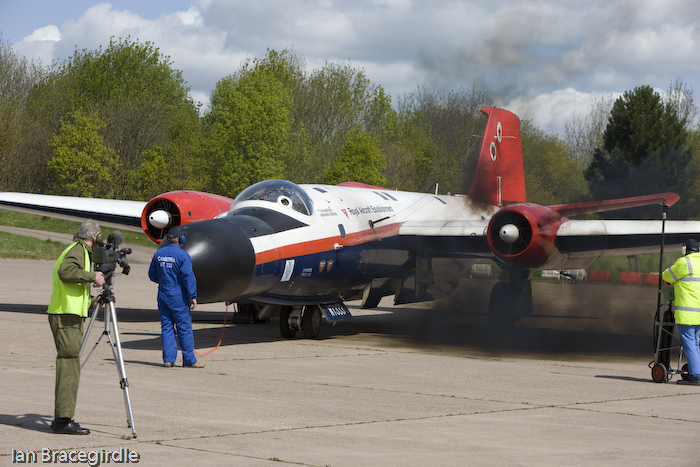 Well… let's face it, if anything can, a Canberra can! 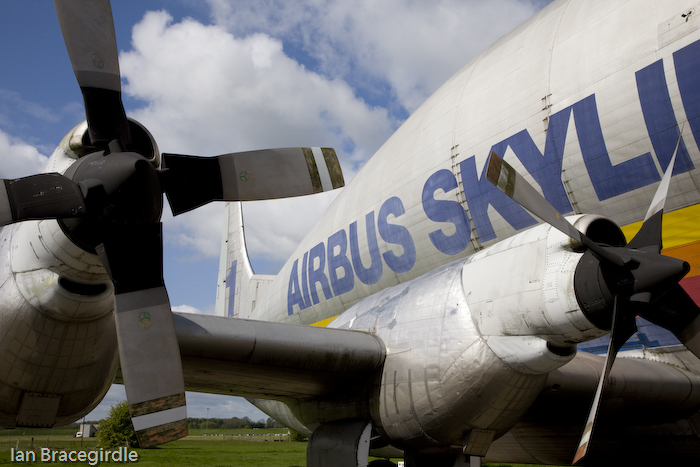 60 years to the very day… Happy Birthday WT333! 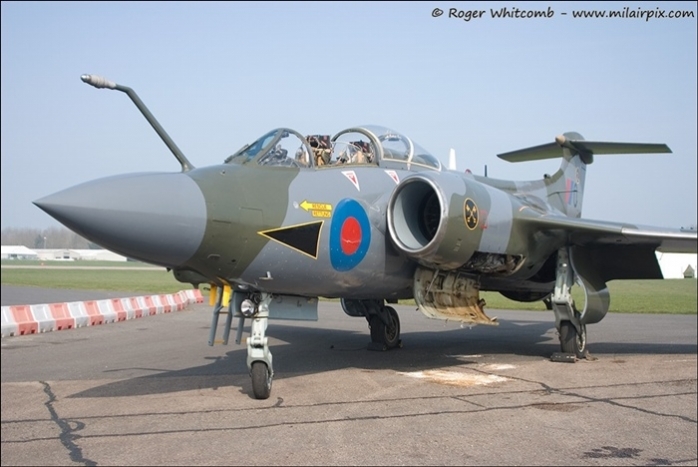 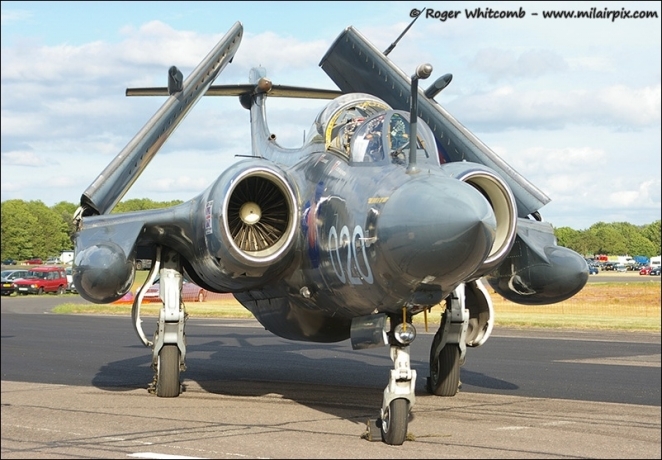 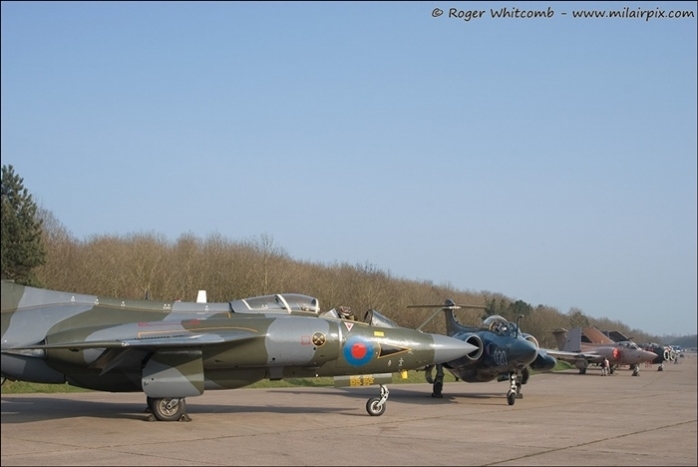 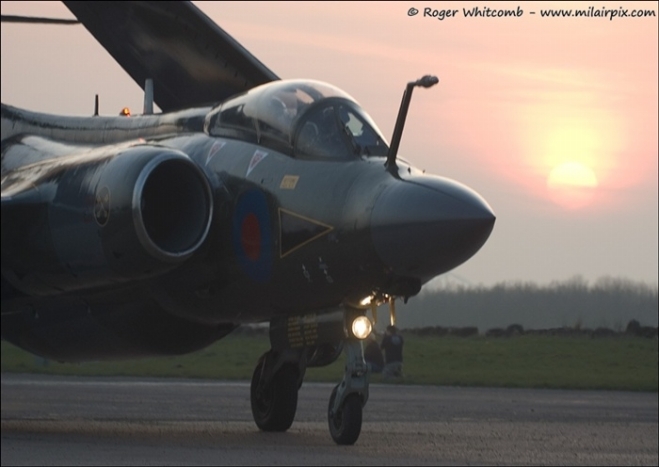 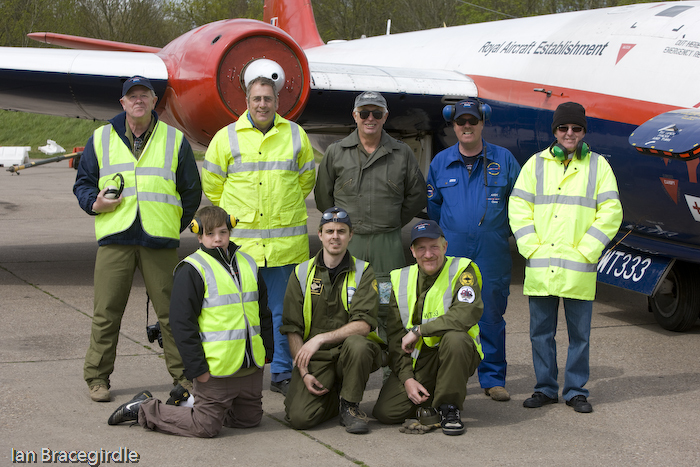 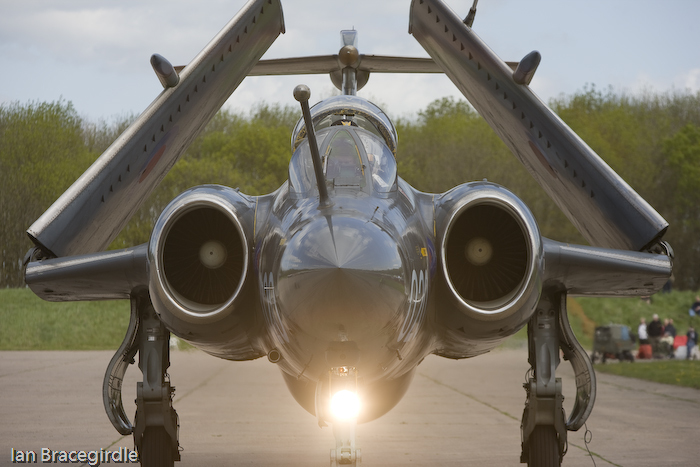 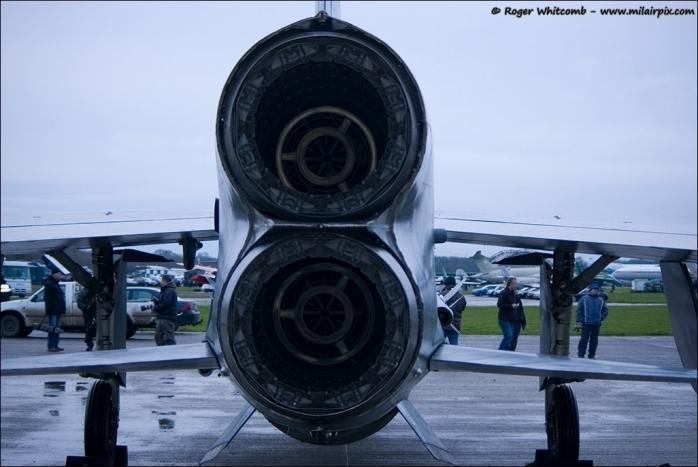 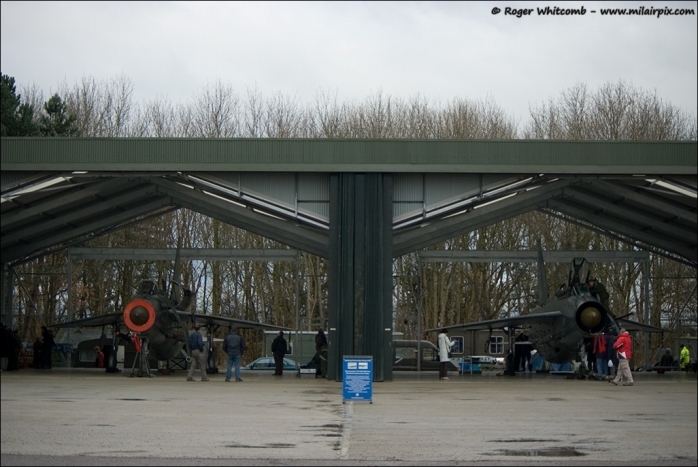 Saturday 24th March 2012, The Buccaneer Association held their first open day at Bruntingthorpe Airfield in Leicestershire for 2012. 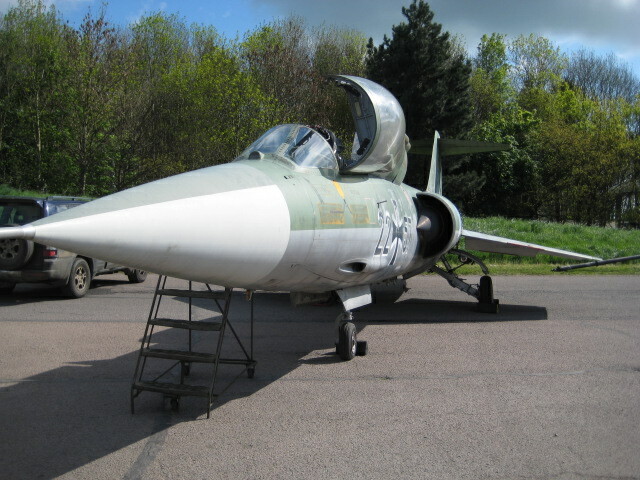 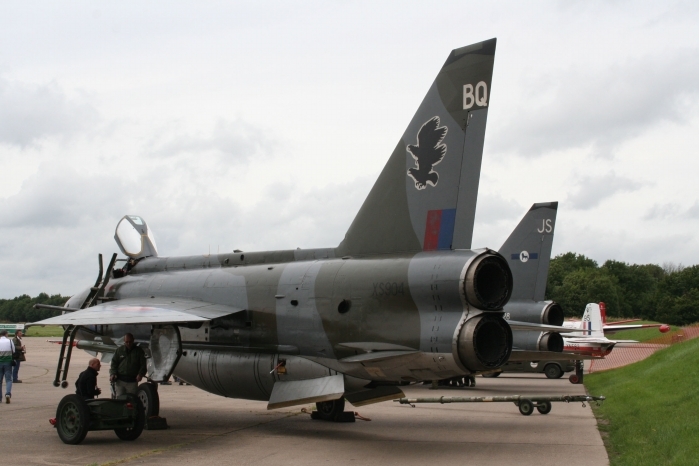 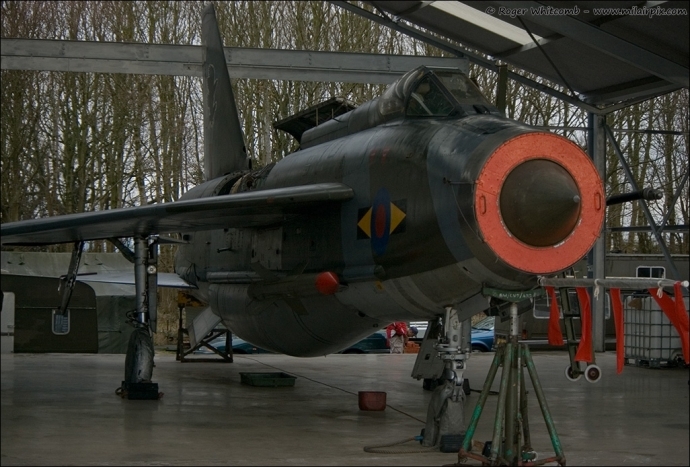 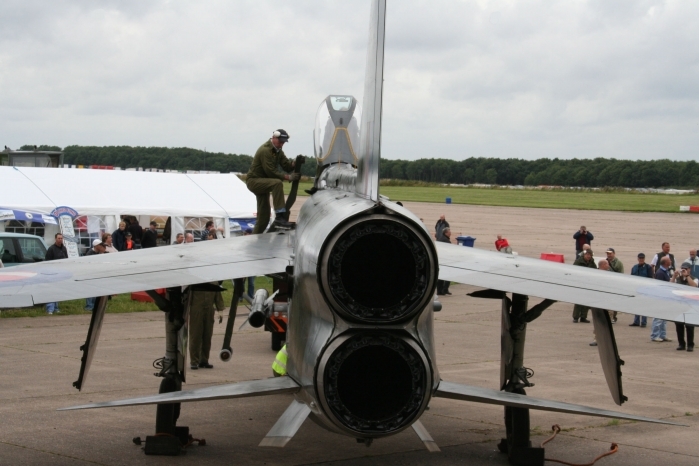 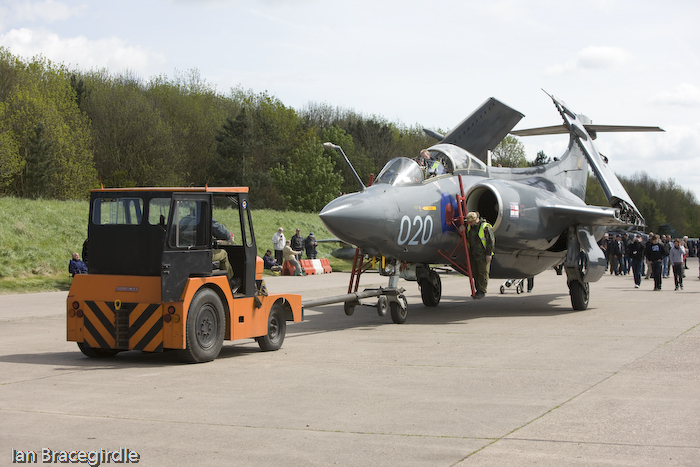 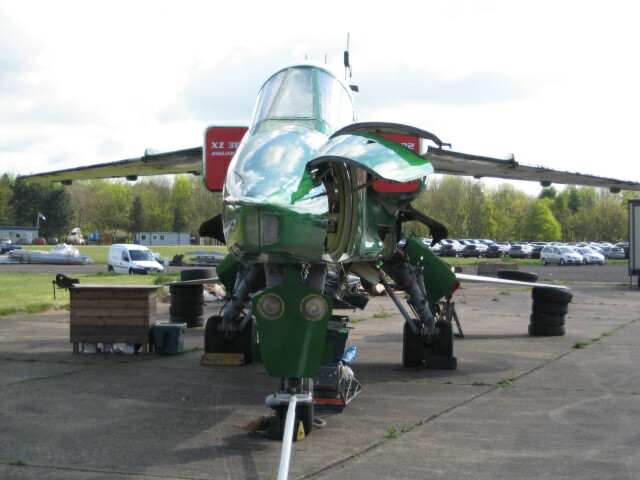 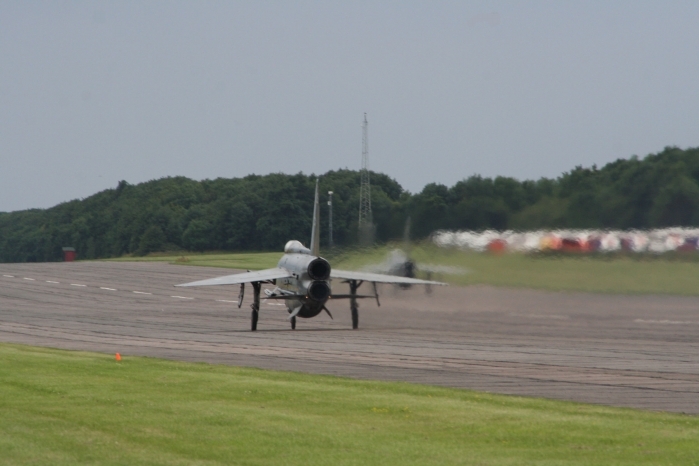 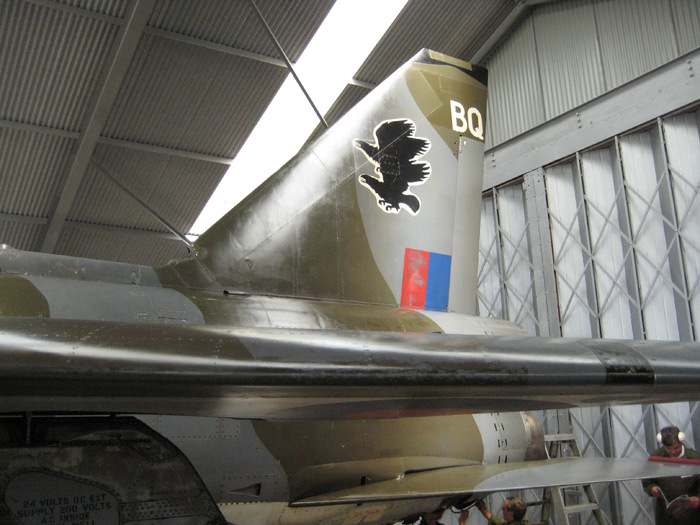 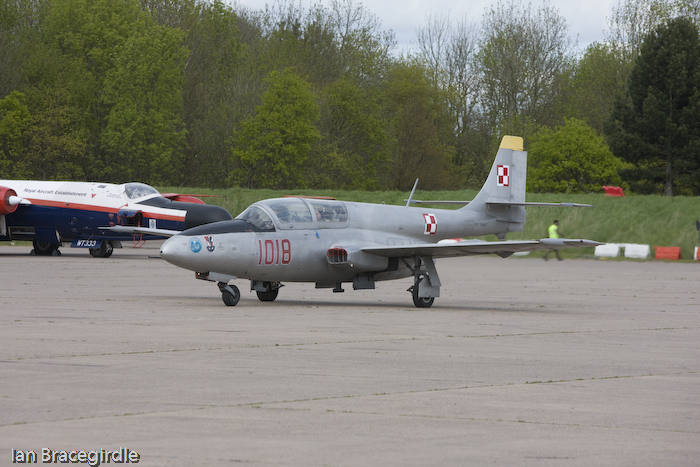 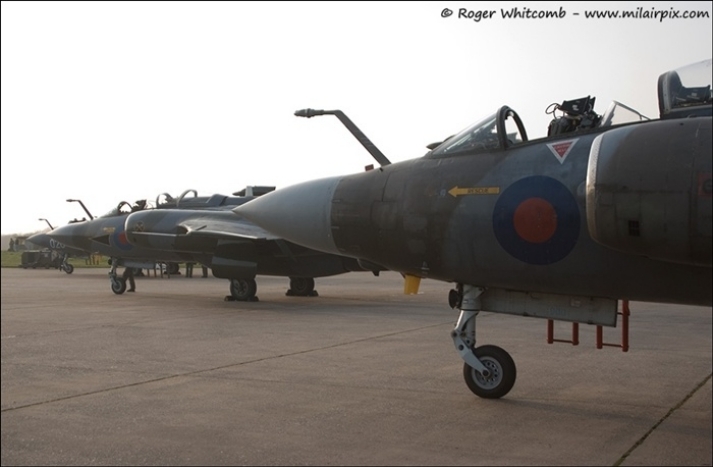 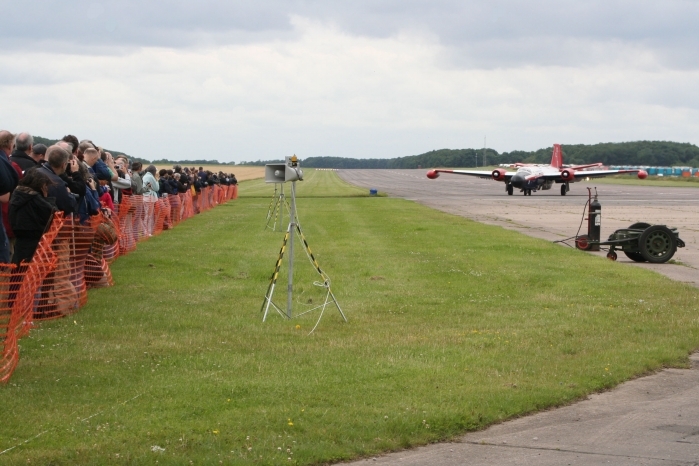 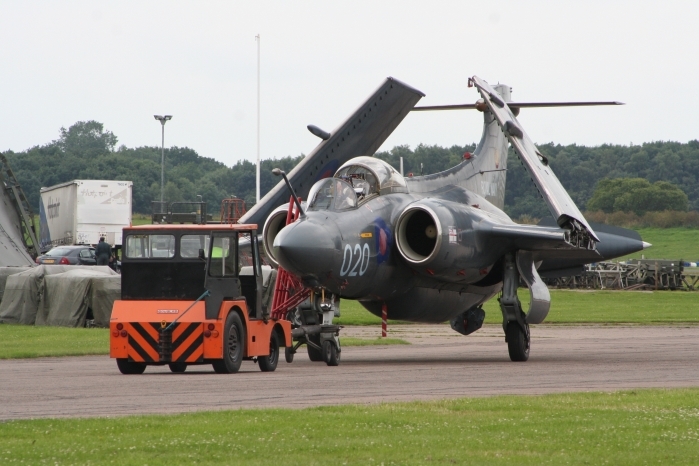 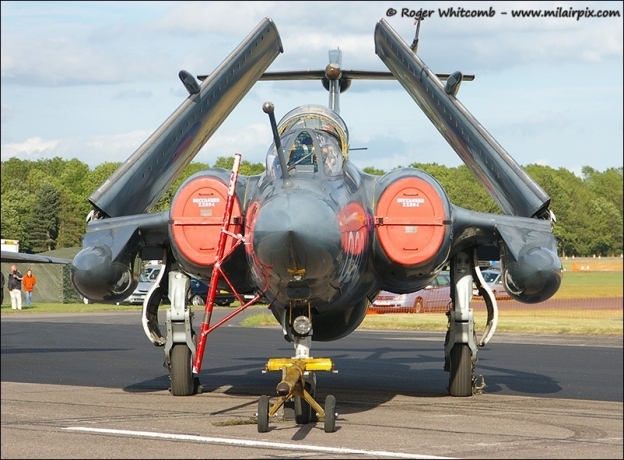 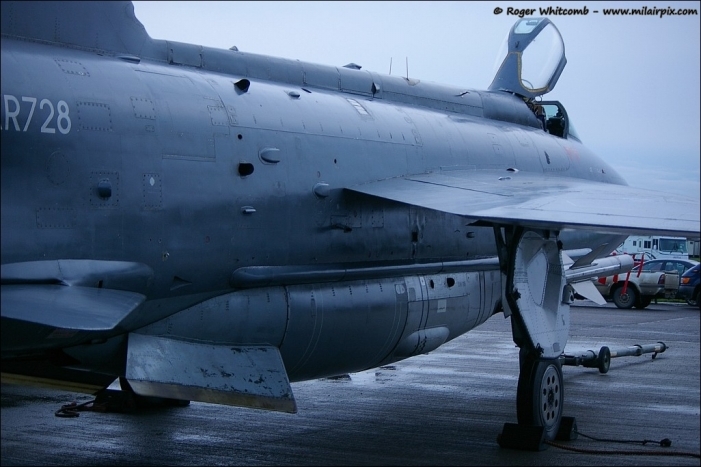 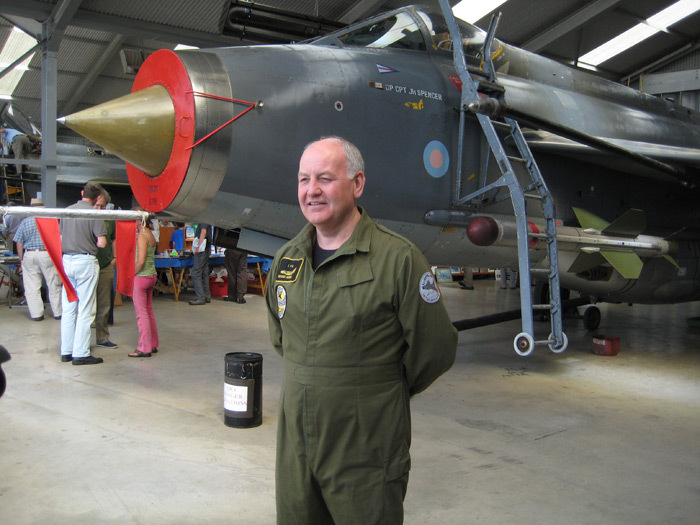 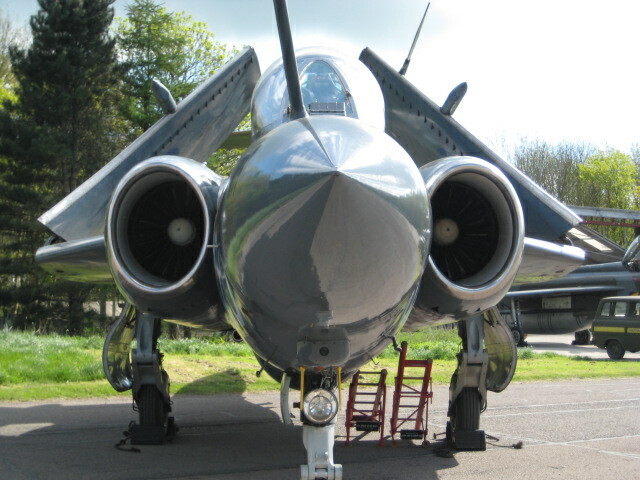 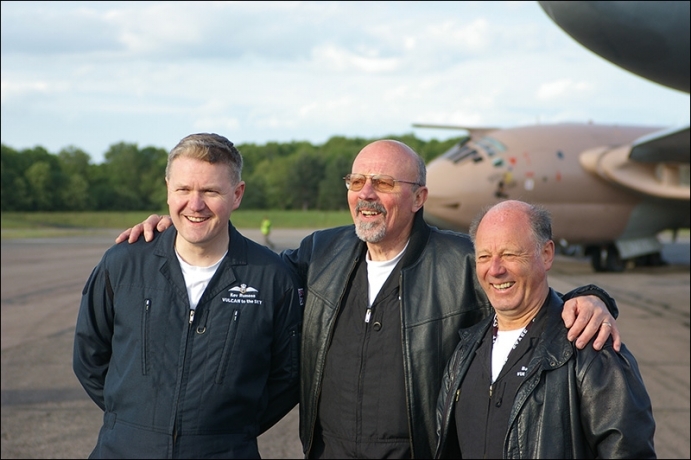 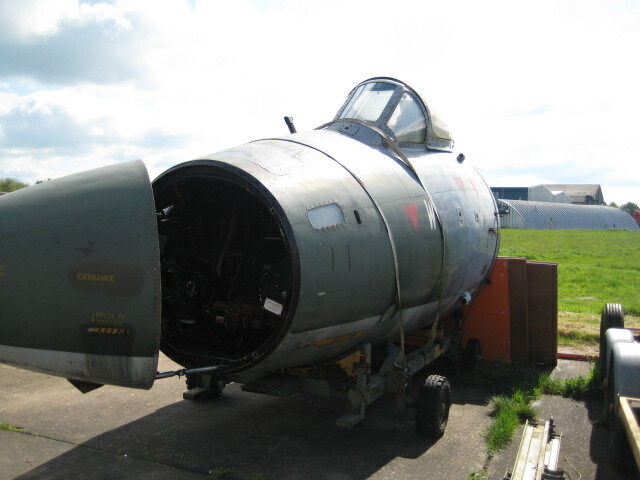 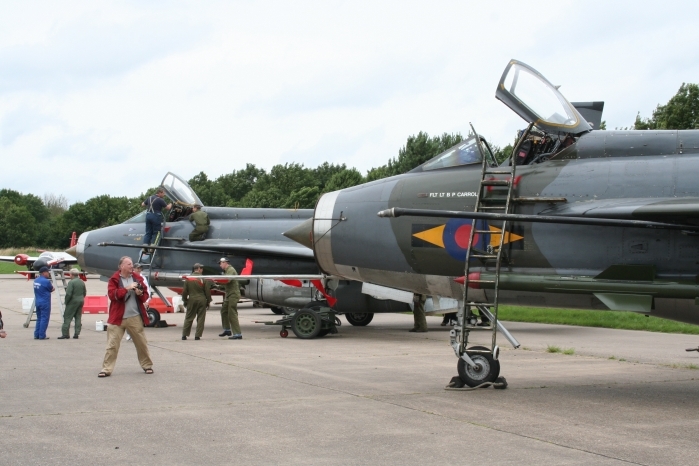 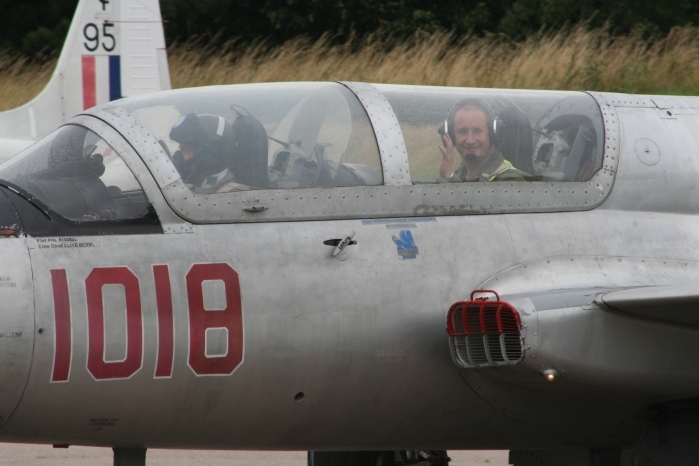 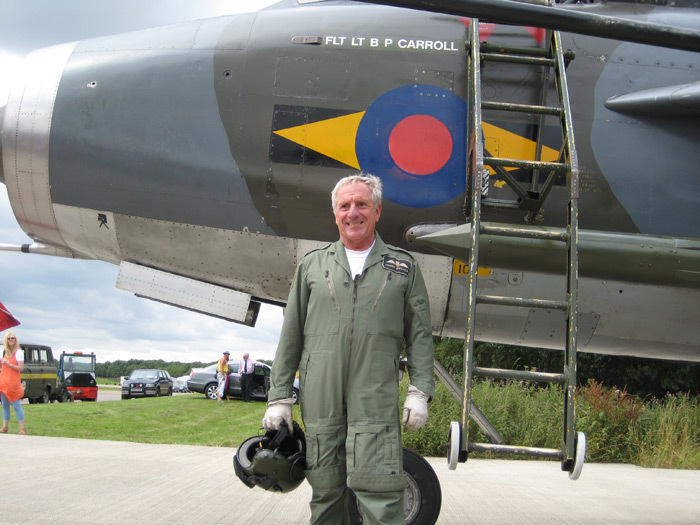 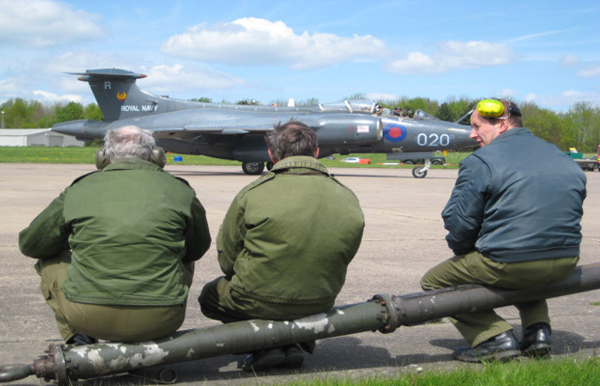 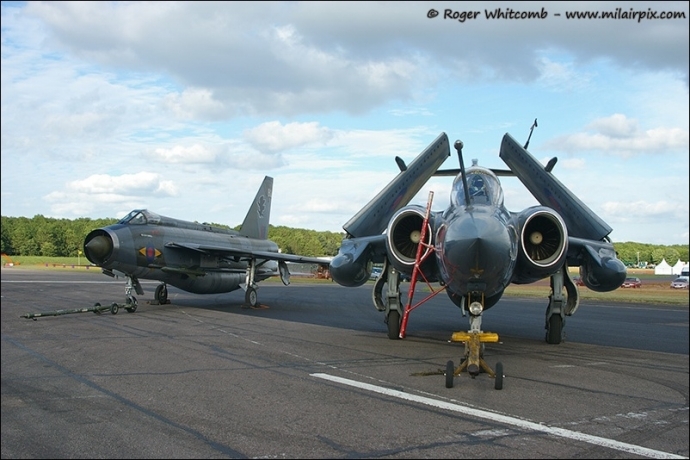 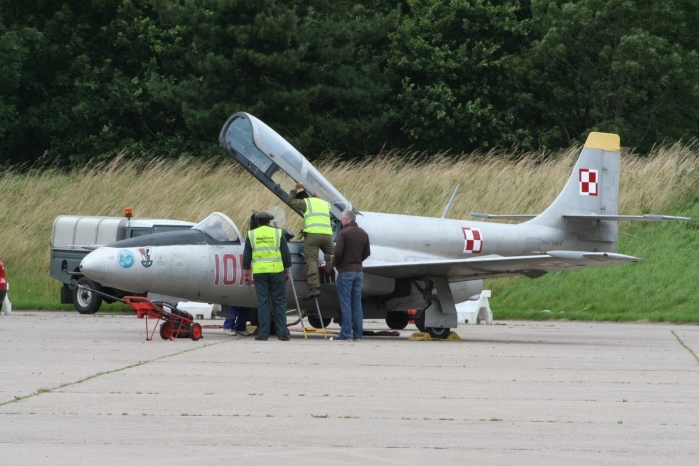 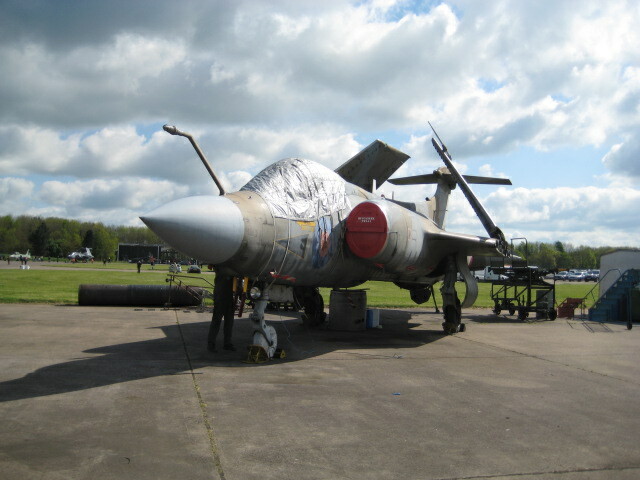 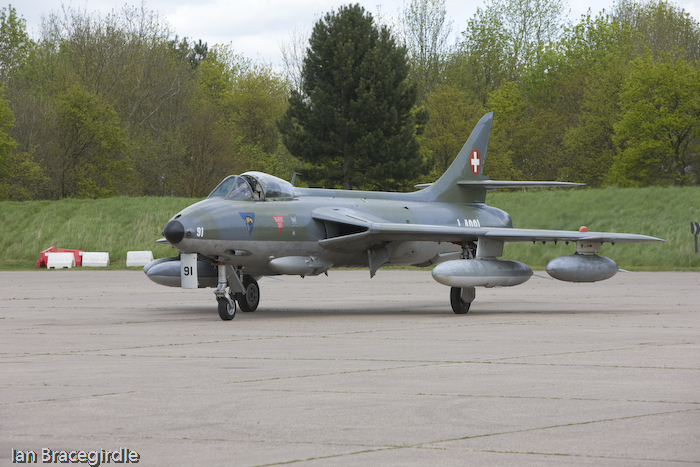 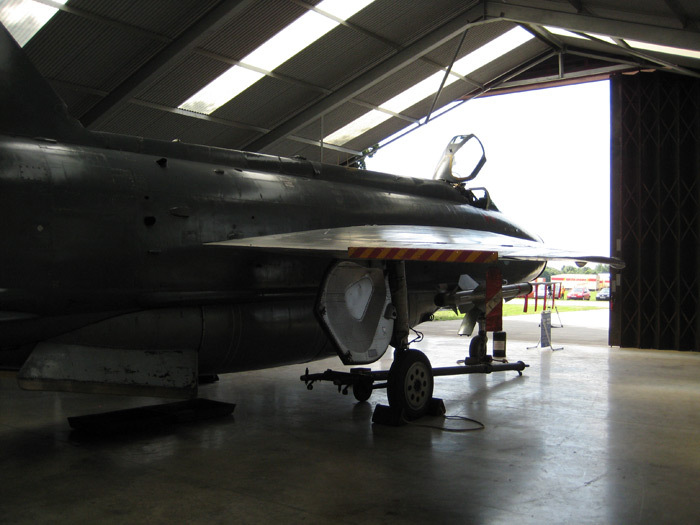 The event was well attended by Ex Buccaneer air and ground crews as well as many aircraft enthusiasts. 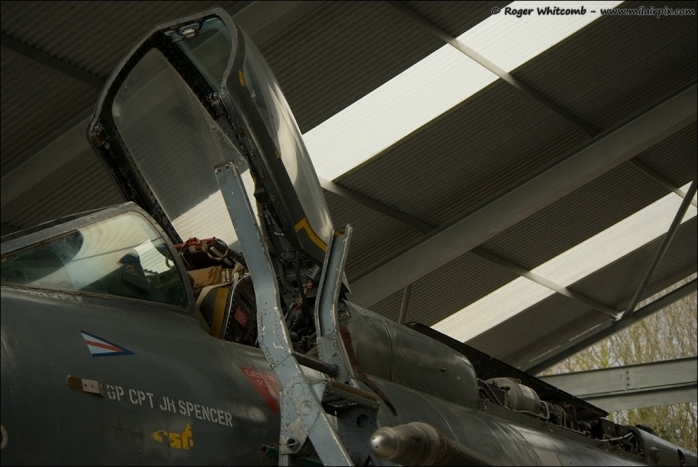 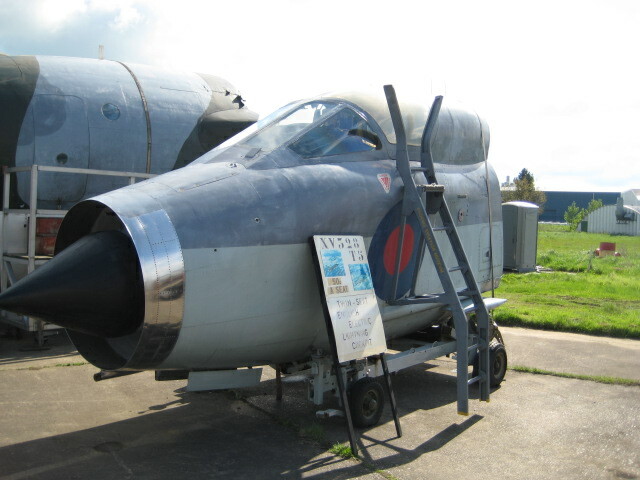 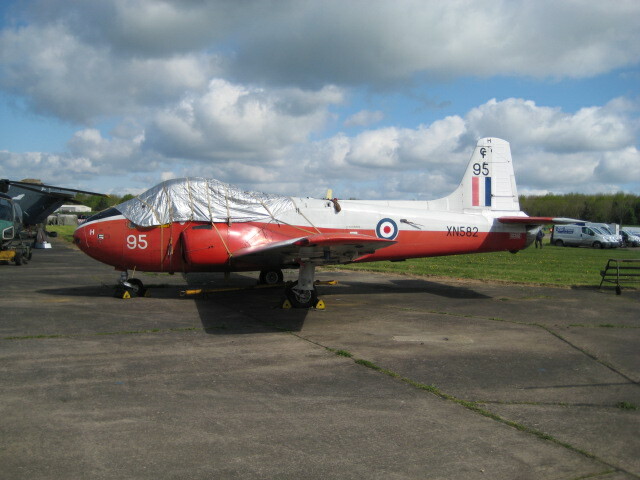 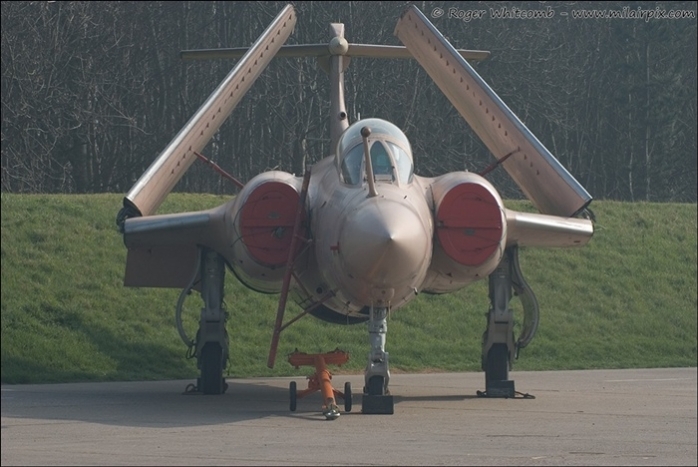 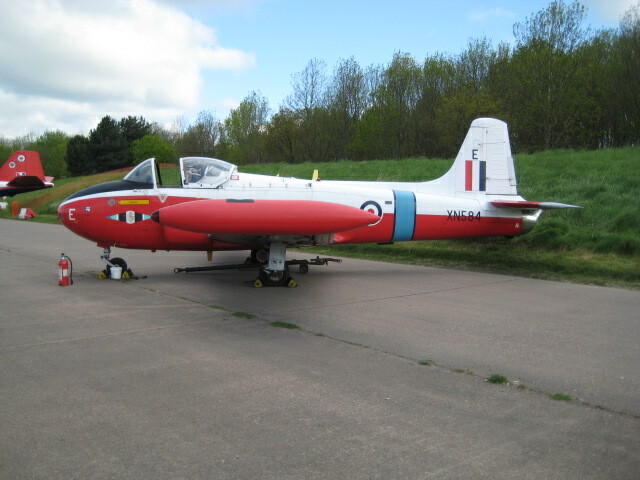 The star attraction was Buccaneer S2B repainted as she would have been when in service with the RAF. 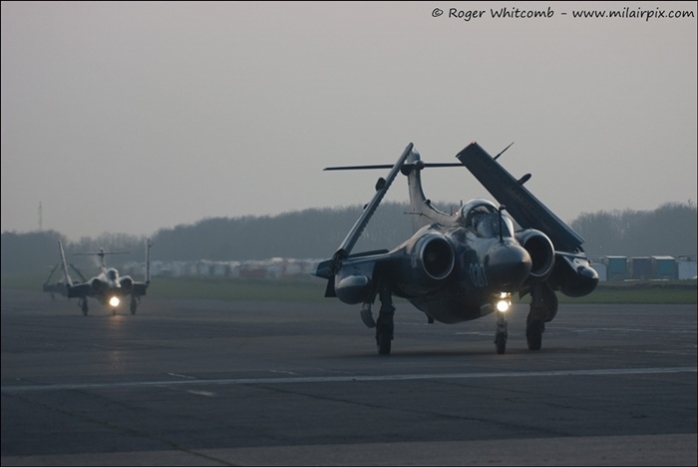 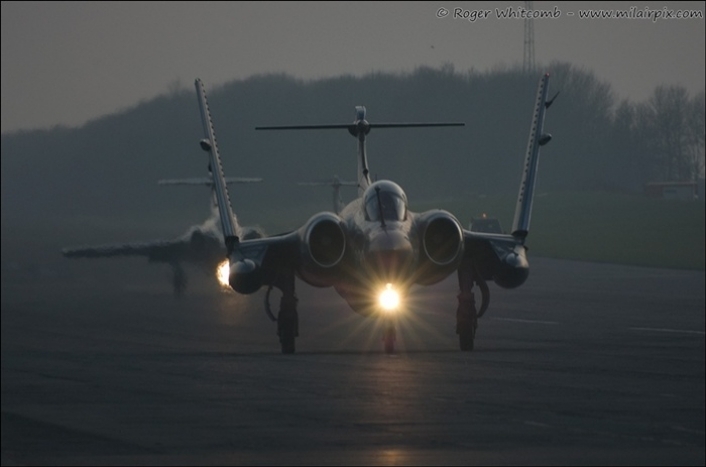 XW544 made her entrance from out of the mist along Bruntingthorpe's vast runway to the joy of the waiting enthusiasts. 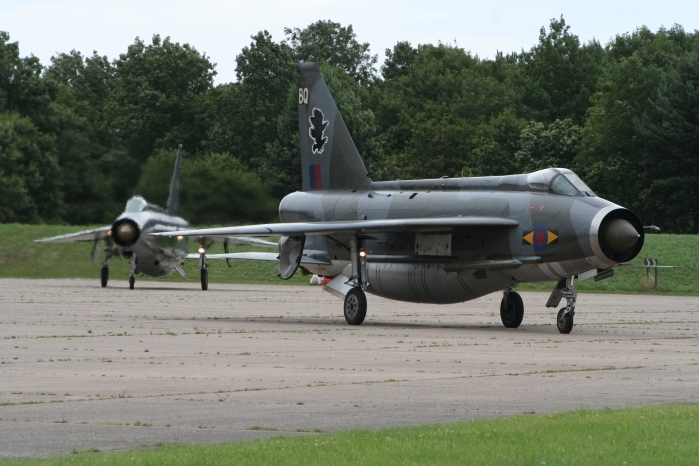 Later the group's pair of aircraft were on show and carried out individual runs. 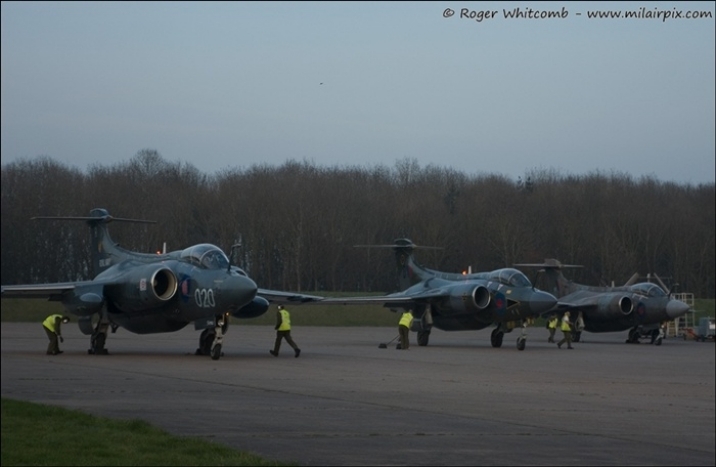 Later in the afternoon all four of Bruntingthorpe’s resident Buccaneers were lined up for a photo shoot, and later as dusk approached the three taxiable aircraft carried out a streamed fast run. 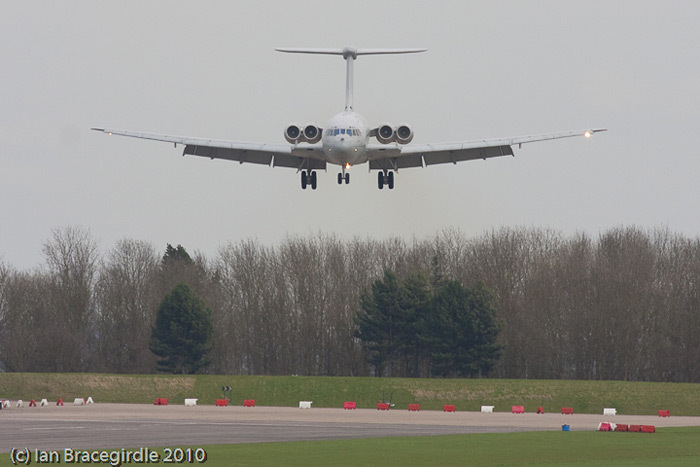 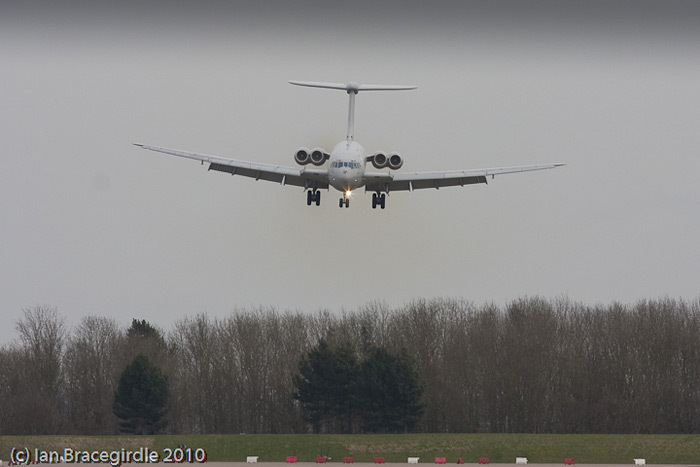 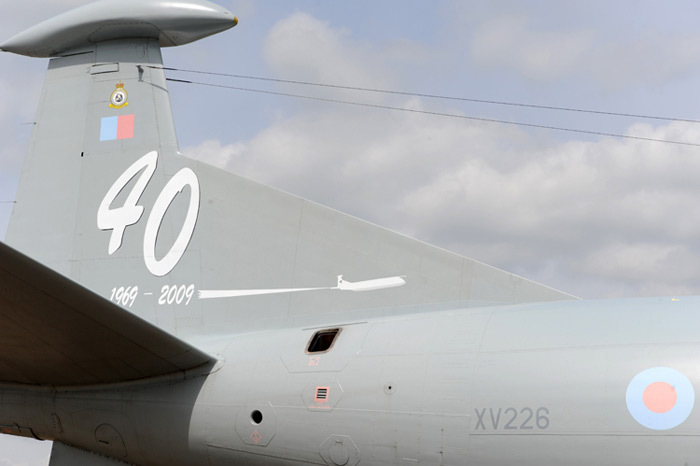 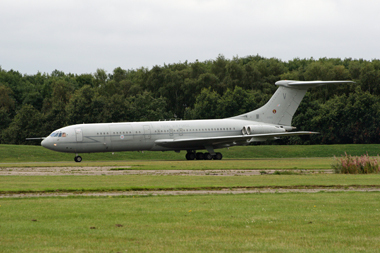 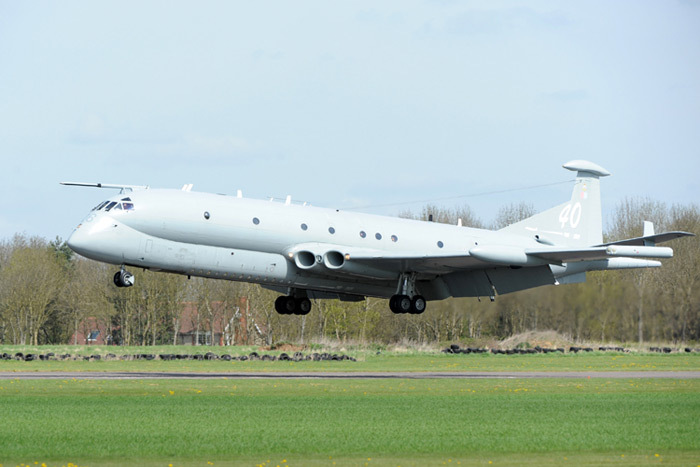 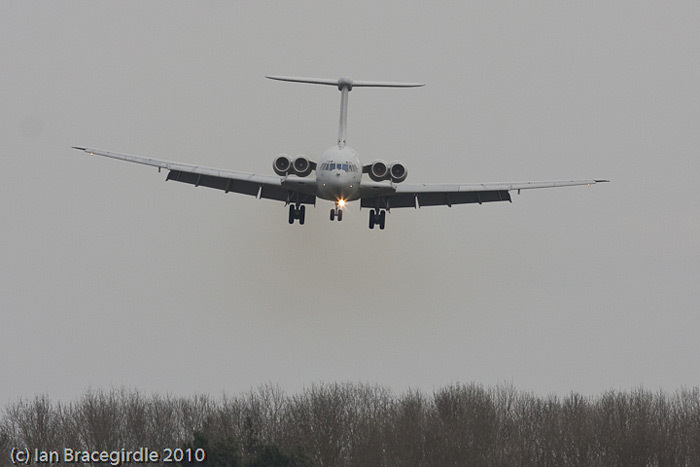 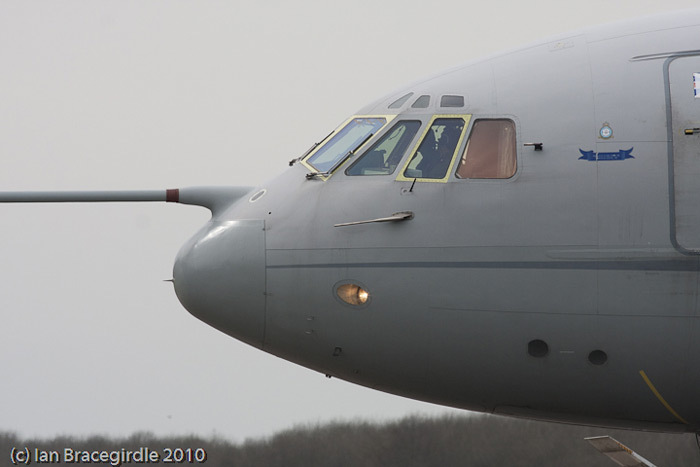 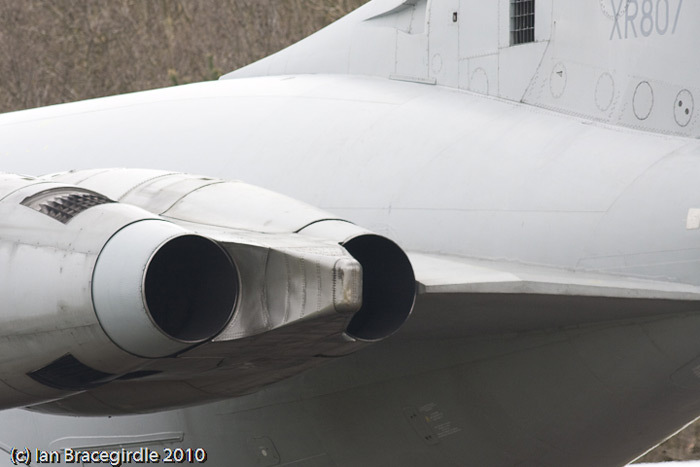 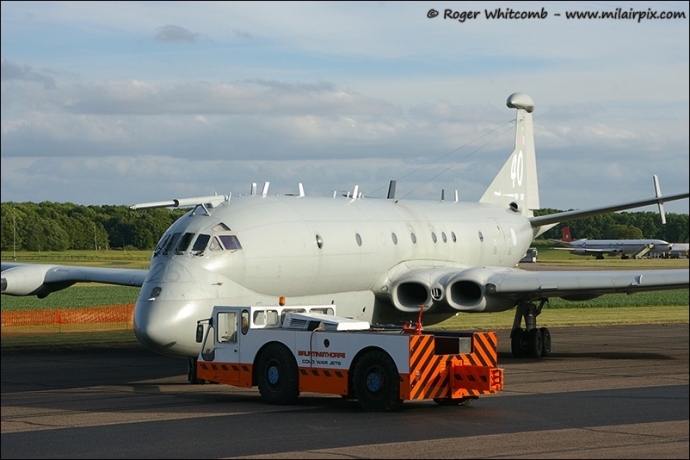 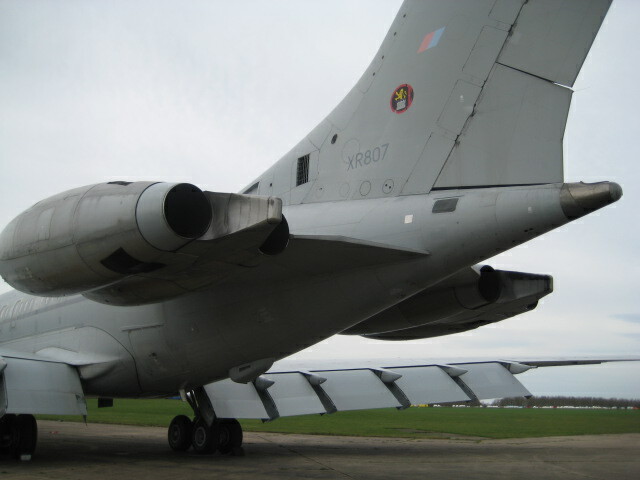 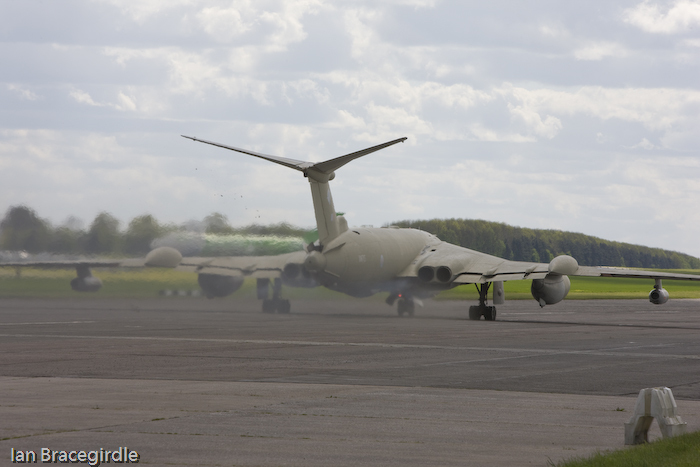 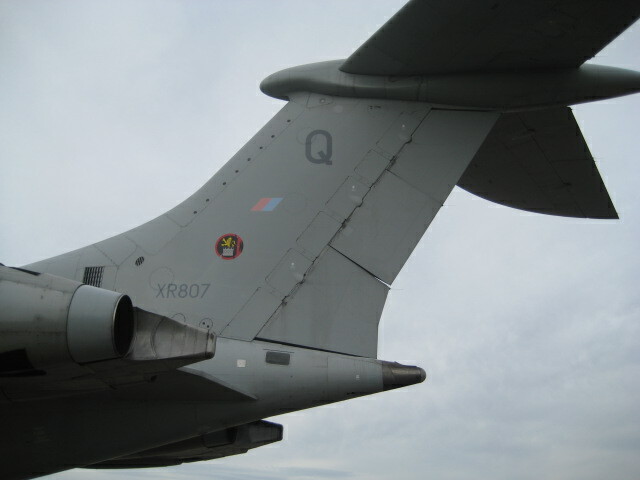 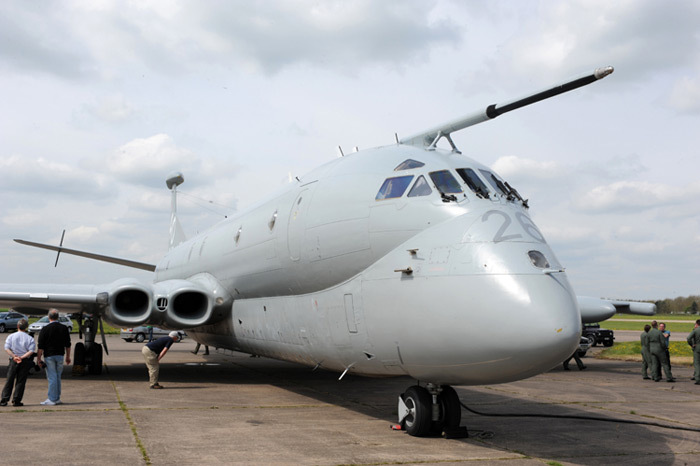 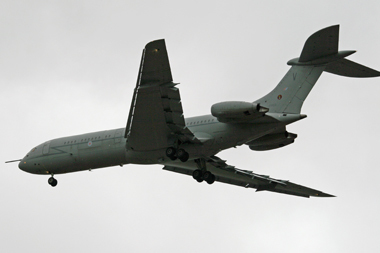 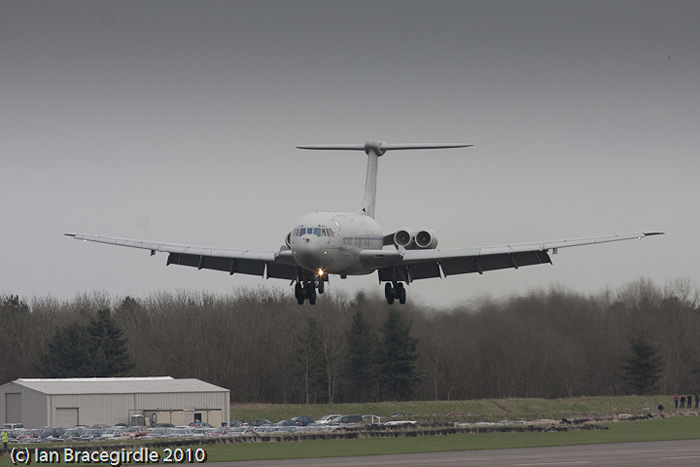 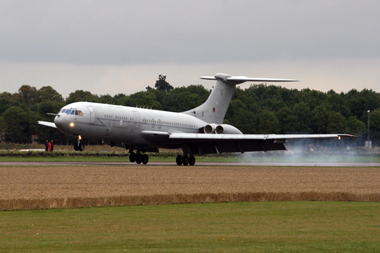 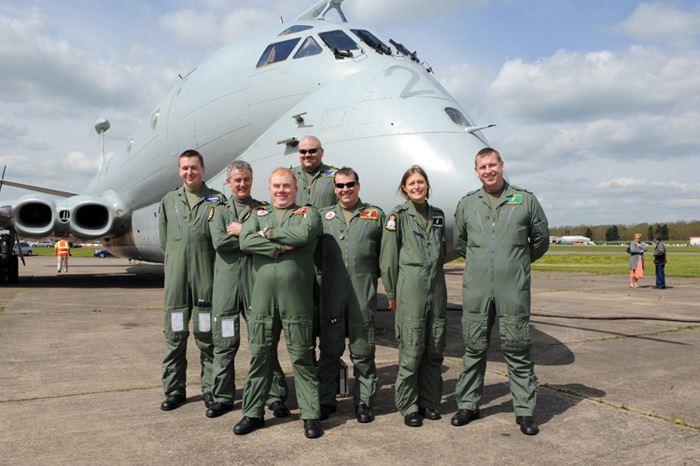 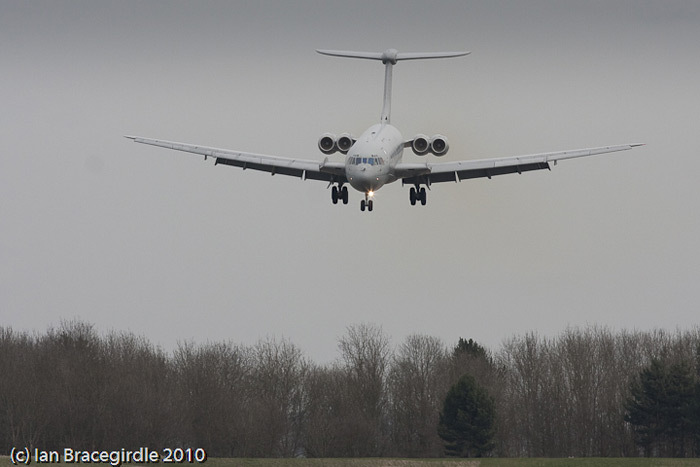 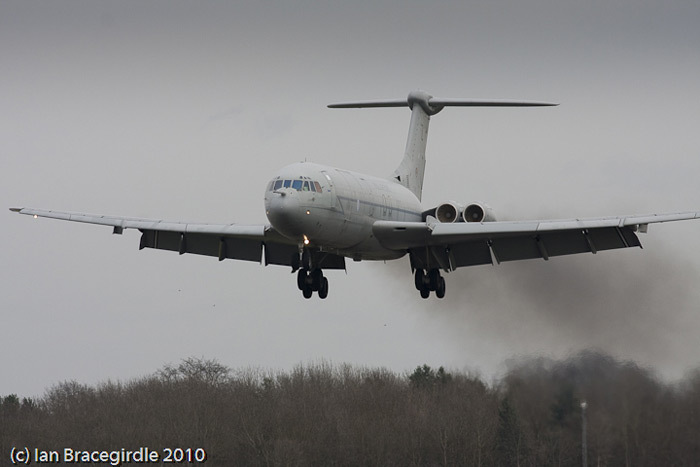 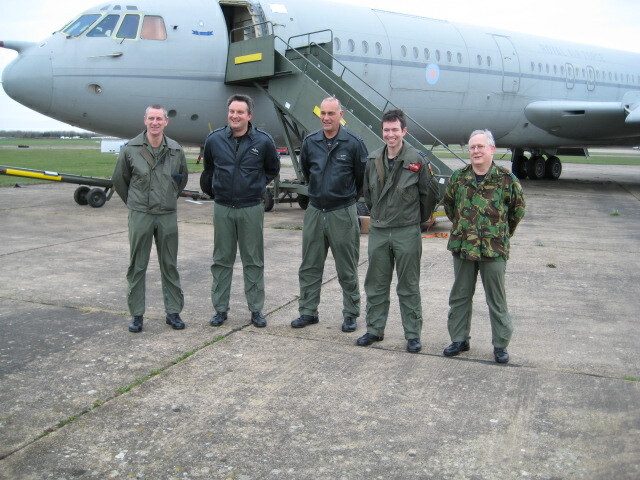 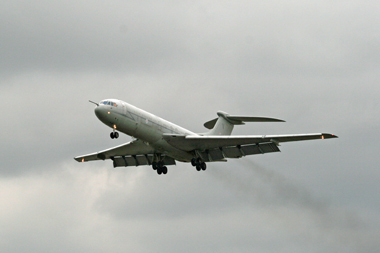 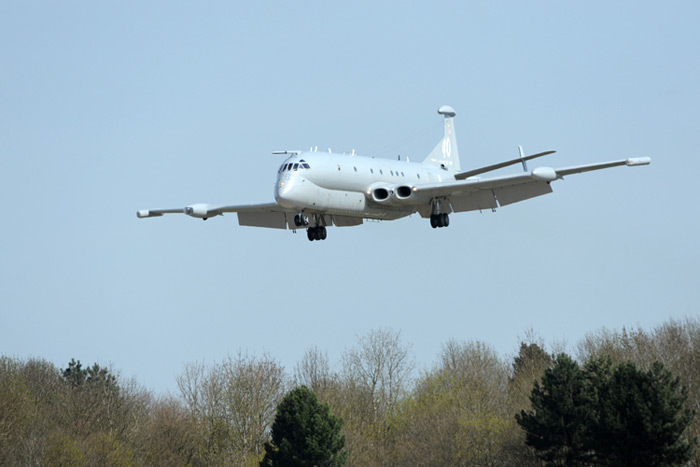 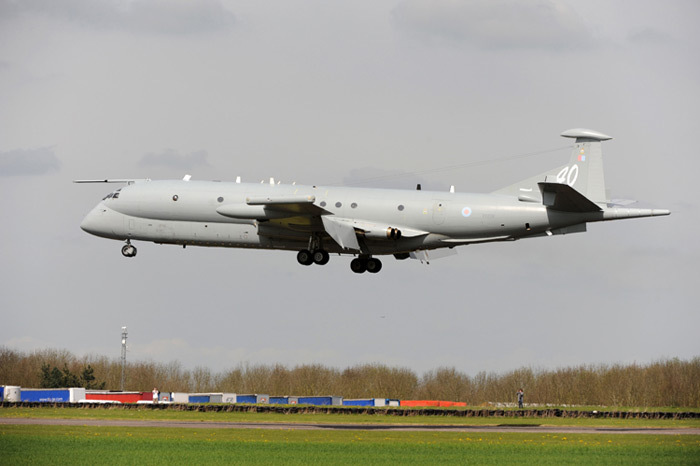 On Tuesday 30th August 2011, VC10 XV105 made its final flight to Bruntingthorpe Airfield. 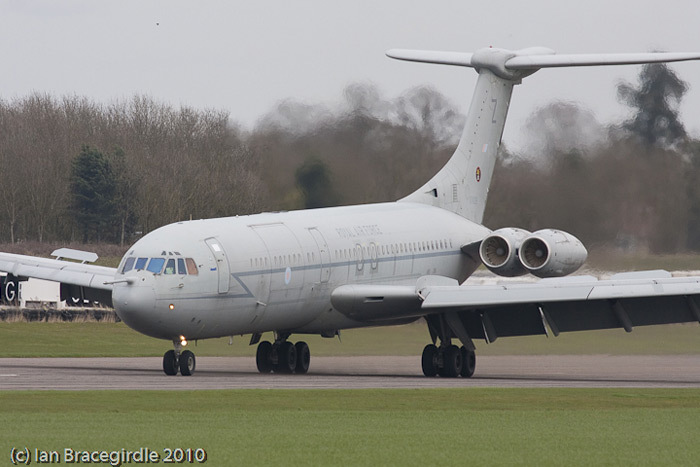 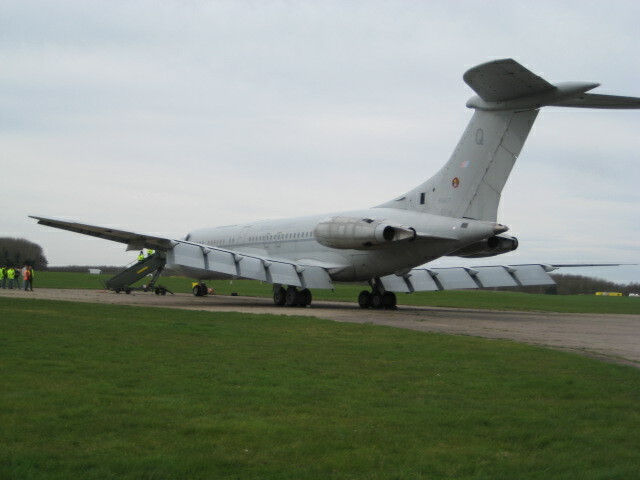 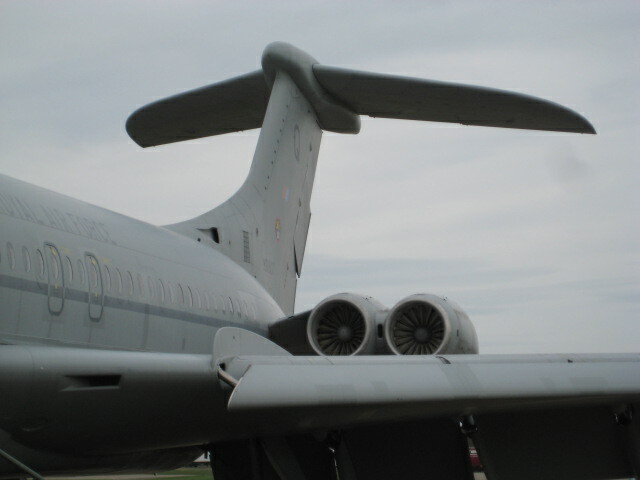 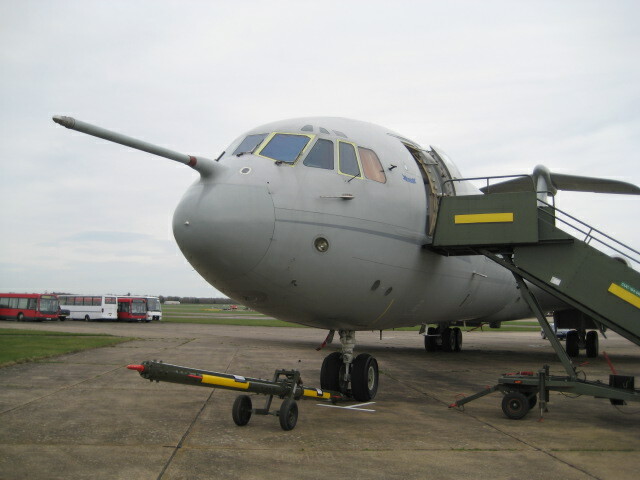 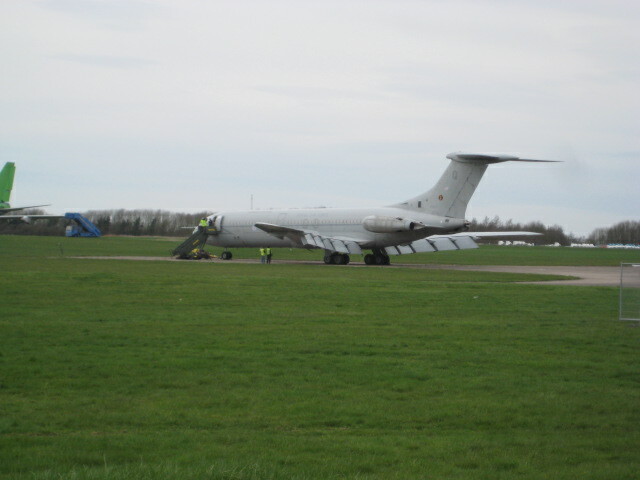 This was the third VC10 to be withdrawn from service in the last few months. 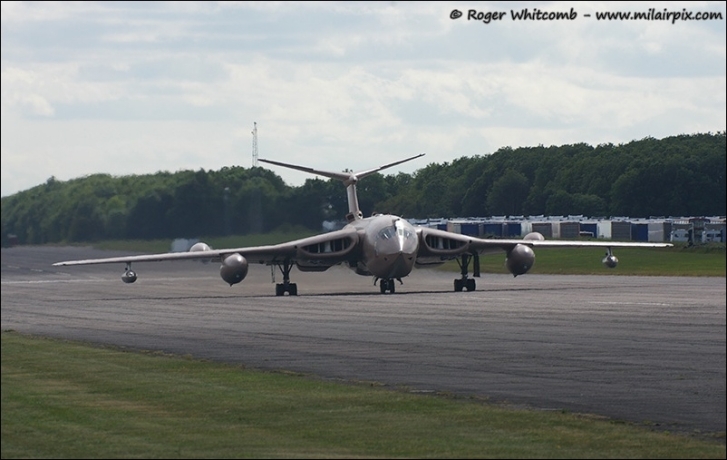 After carrying out an overshoot 105 carried out a visual circuit before touching down for the last time. 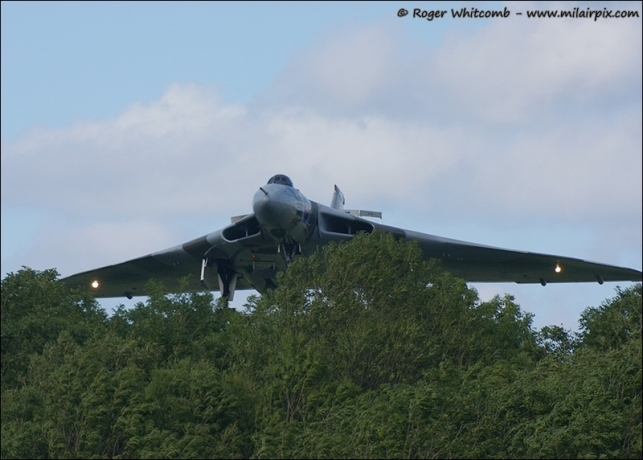 After several years absence it was nice to see Avro Vulcan XH558 back at her old home again. 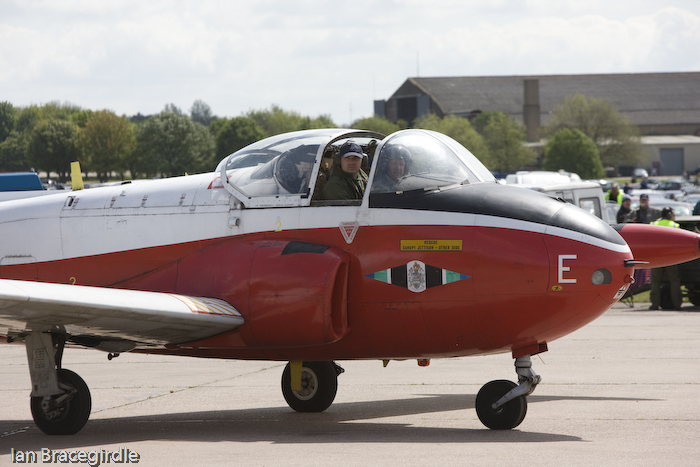 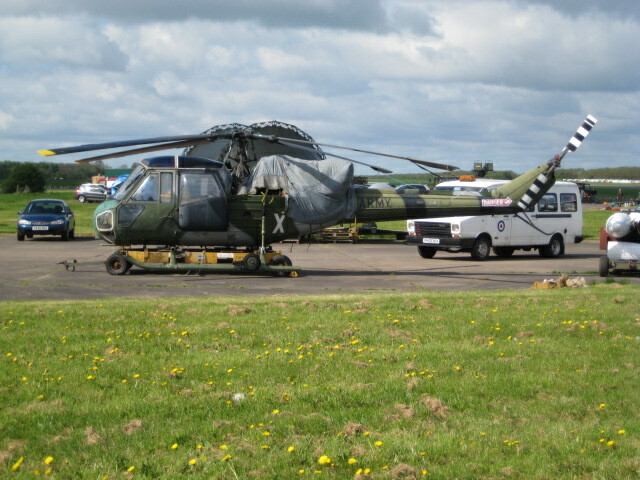 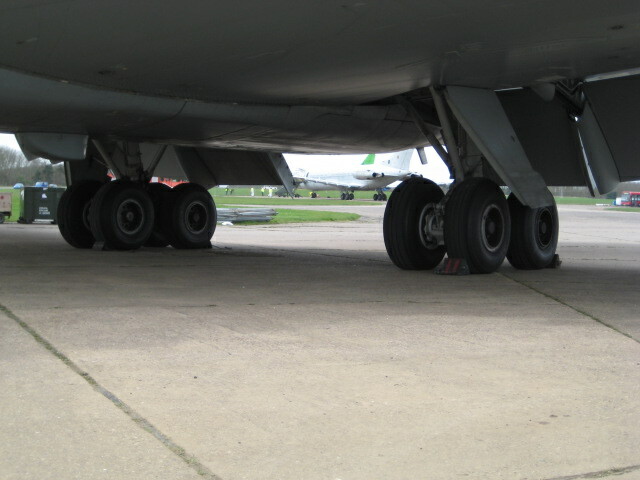 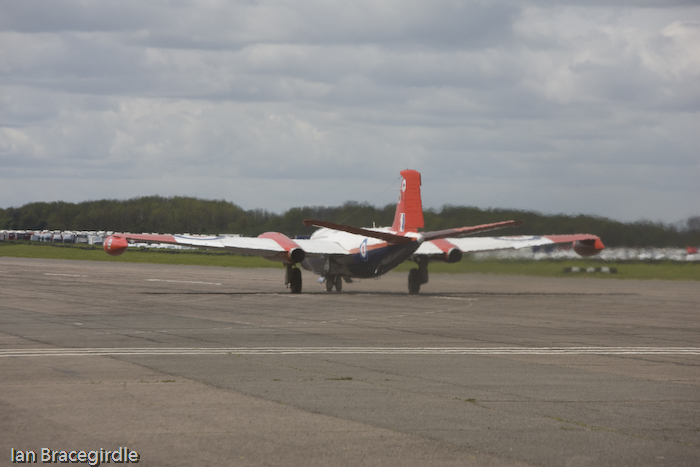 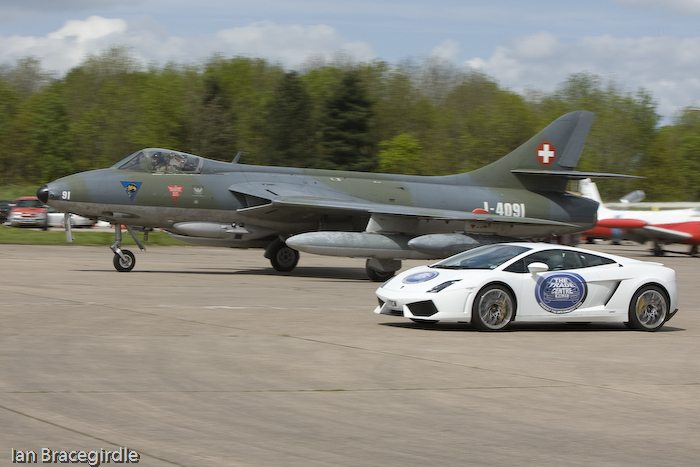 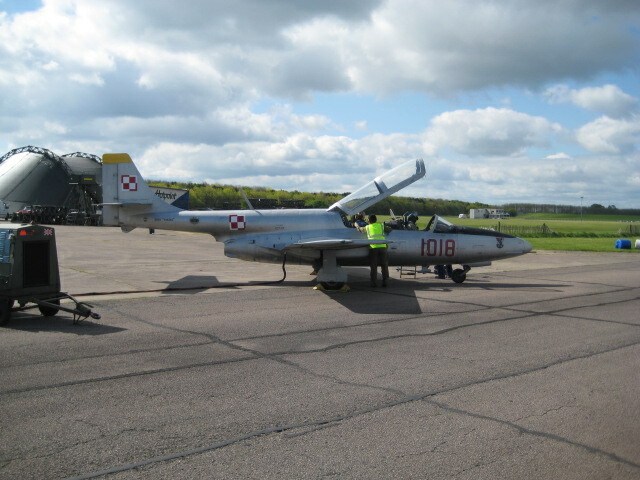 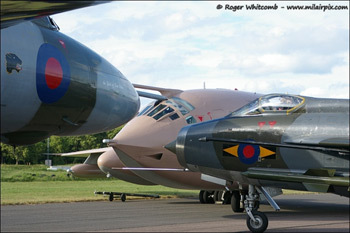 After landing she was positioned on the runway and soon joined by some of Bruntingthorpe’s full time resident aircraft. 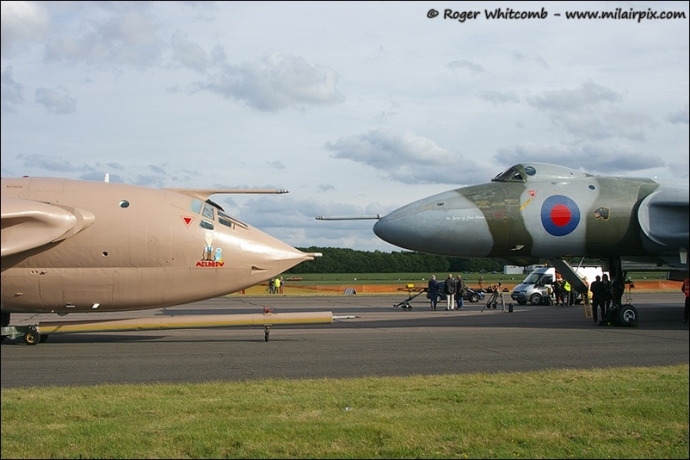 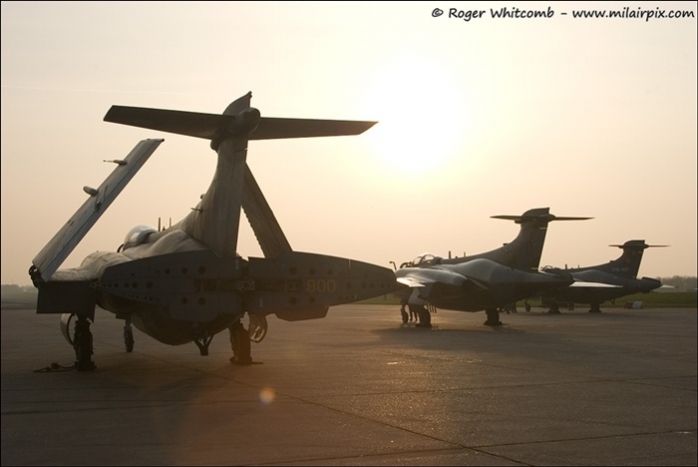 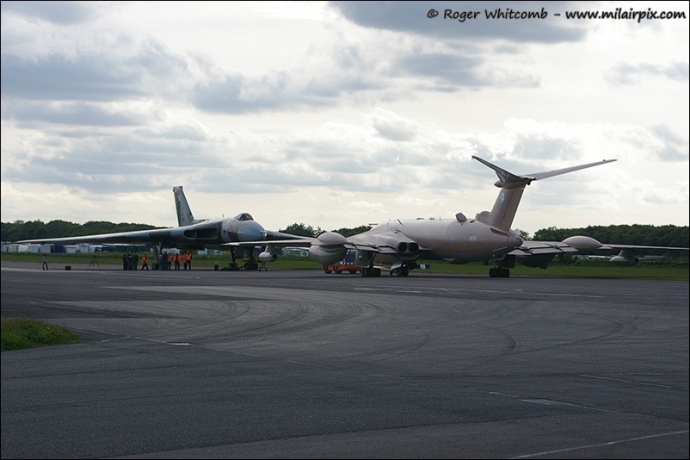 How often can you see two V Bombers parked together in this day and age? 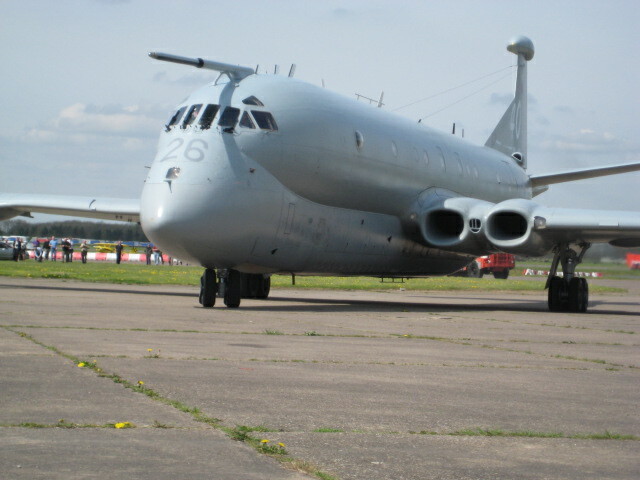 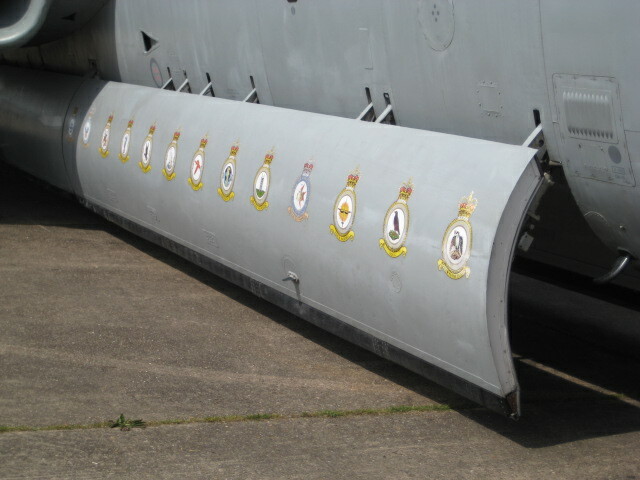 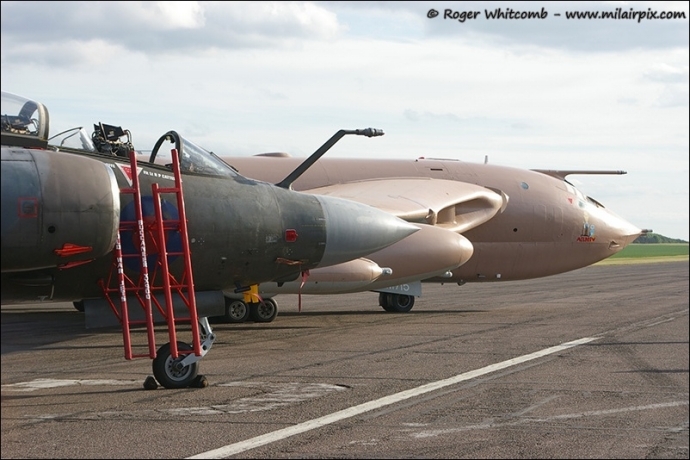 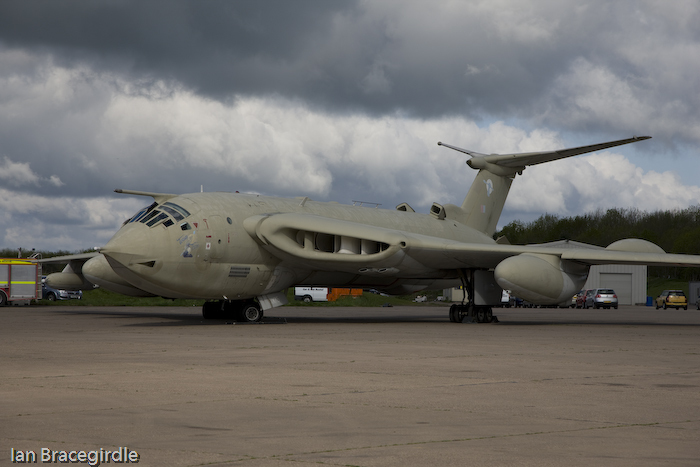 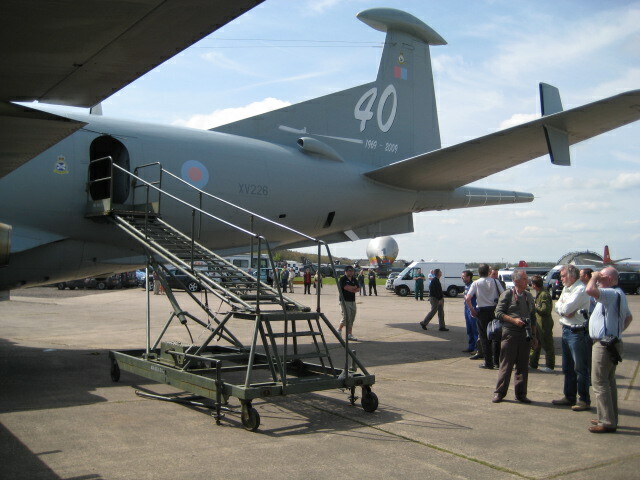 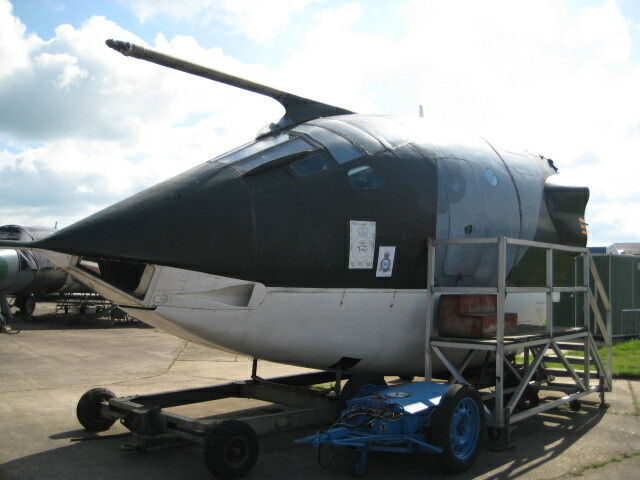 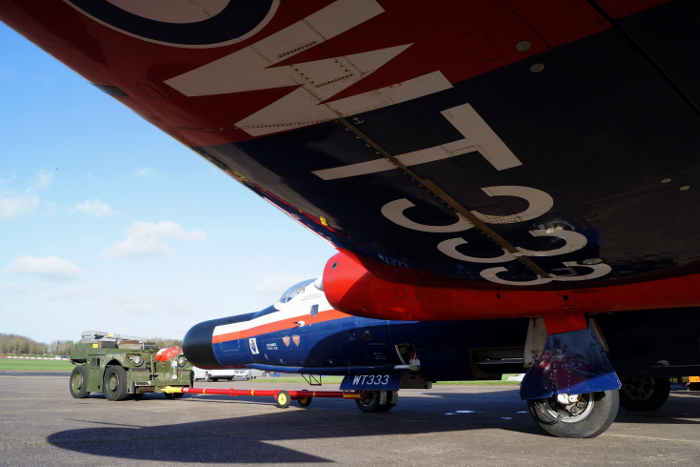 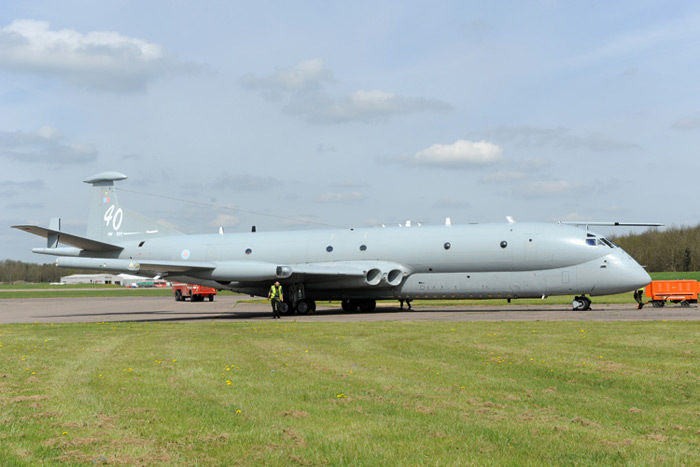 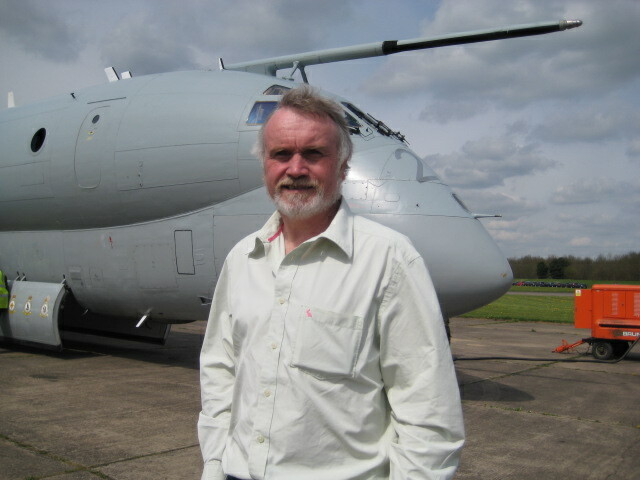 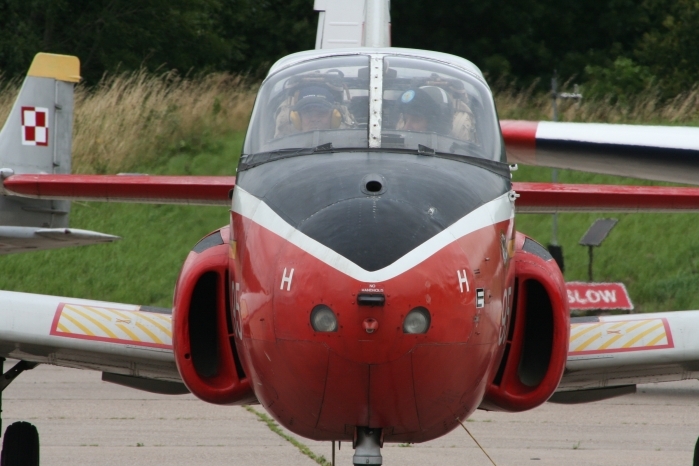 Other aircraft in the line up included Nimrod XV226, a pair of Buccaneers and a Lightning. 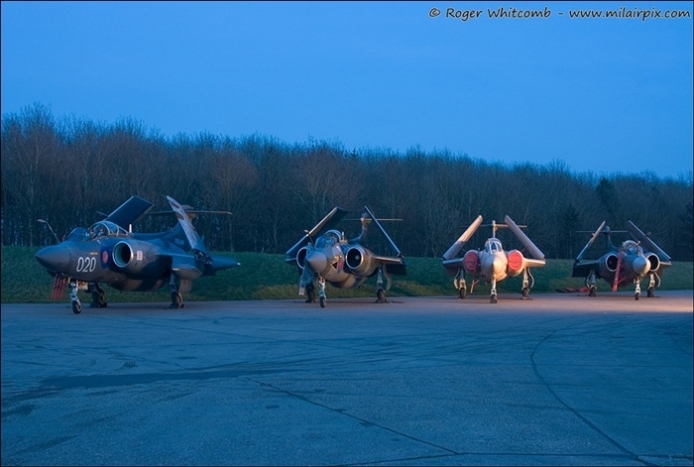 What a privilege to see this many great British aircraft all in one location. 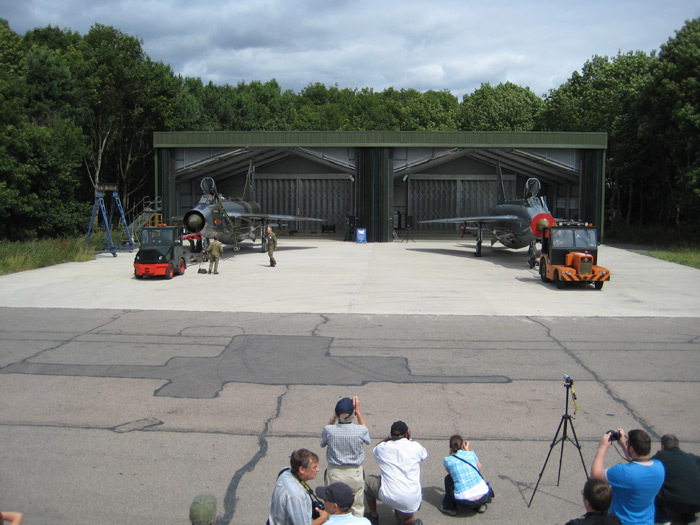 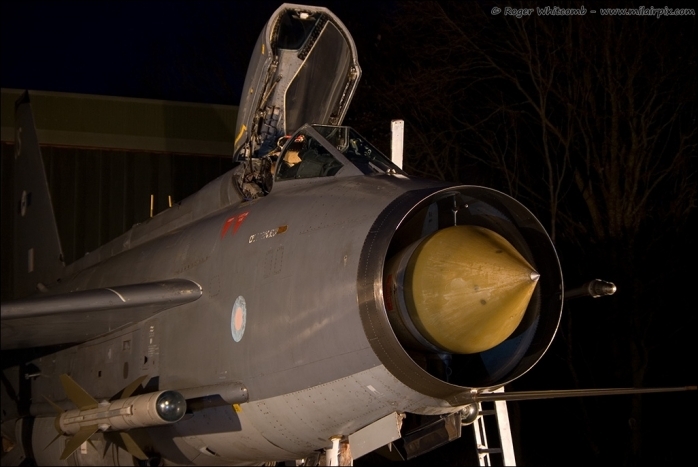 Bruntingthorpe in Leicestershire opened its gates to celebrate the 50th anniversary of the Lightning into service and the official opening of the Ex RAF Wattisham Lightning Q shed. 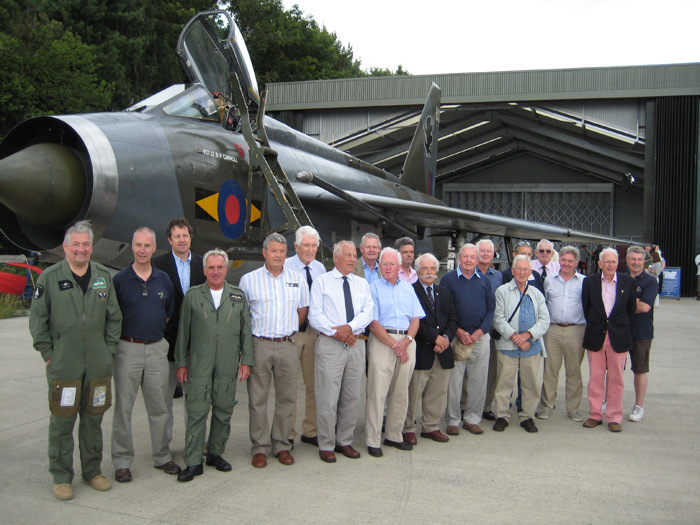 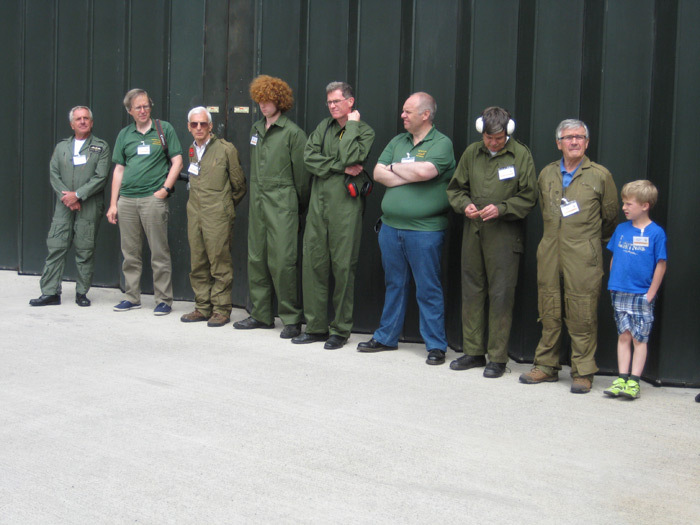 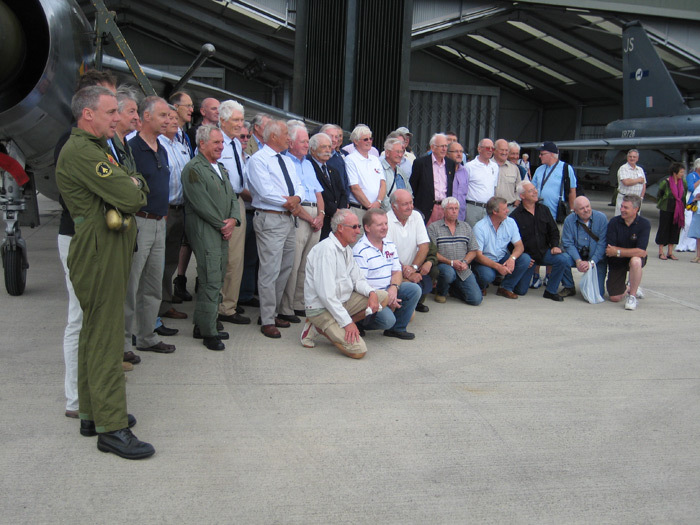 With over thirty Ex Lightning pilots attending and a large group of enthusiasts who have supported the two Lightnings and the rebuilding of the Q shed, as well as many of the Lightning Preservation Group members. 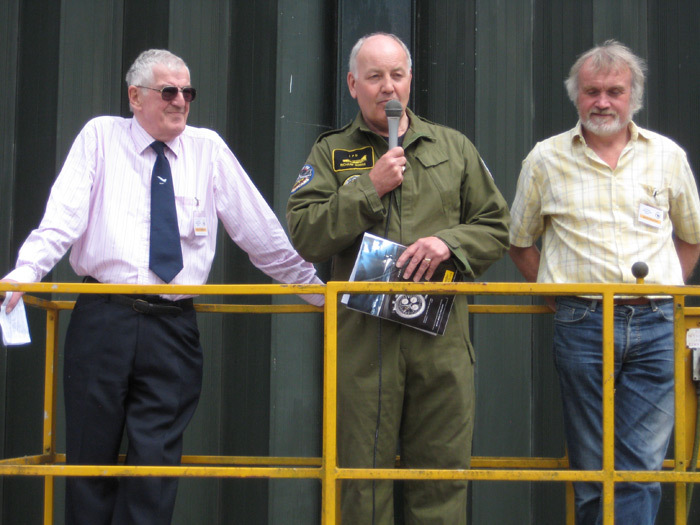 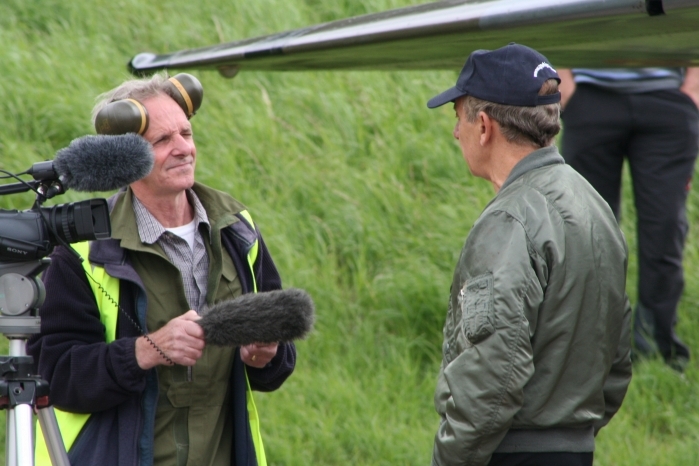 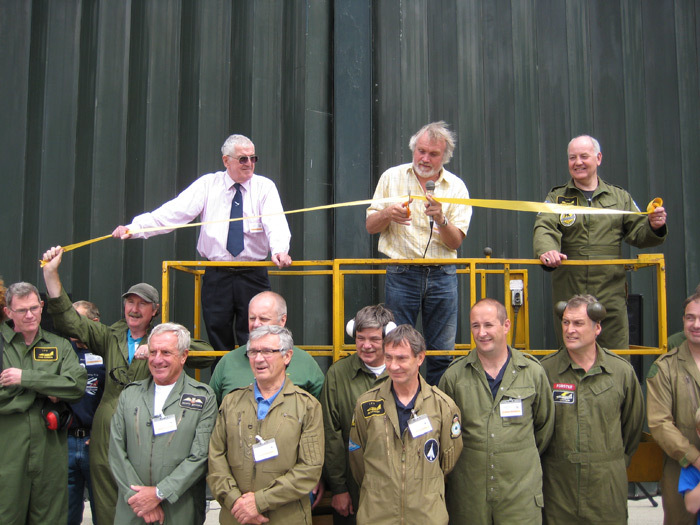 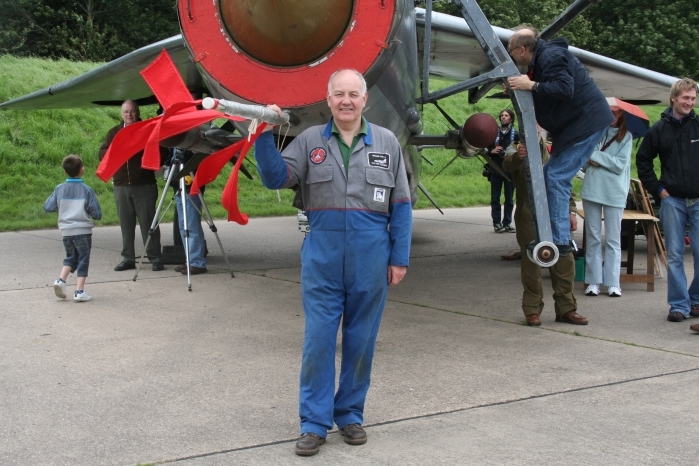 Speeches were made by the airfield owner David Walton and the Lightning Preservation Group president Richard Norris and Group Captain John Spencer (RAF Binbrook's last Station Commander) followed by the cutting of the ribbon by David Walton. 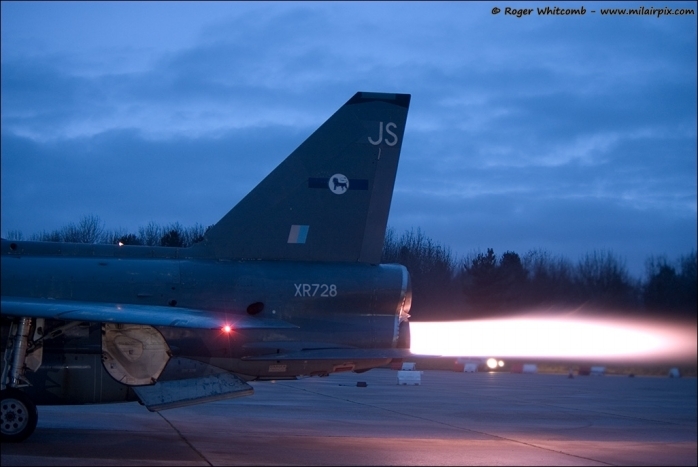 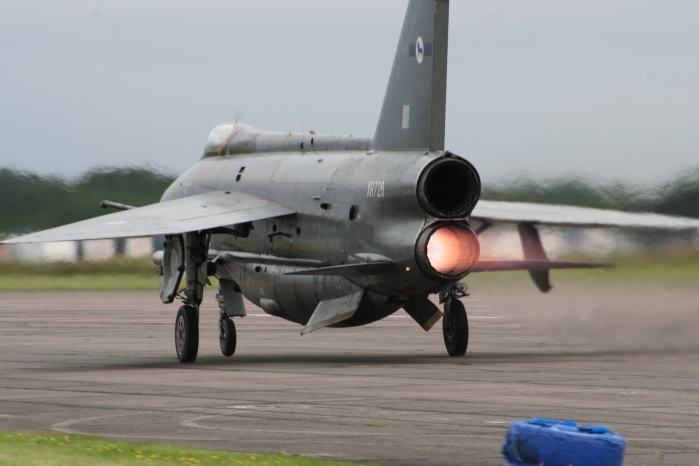 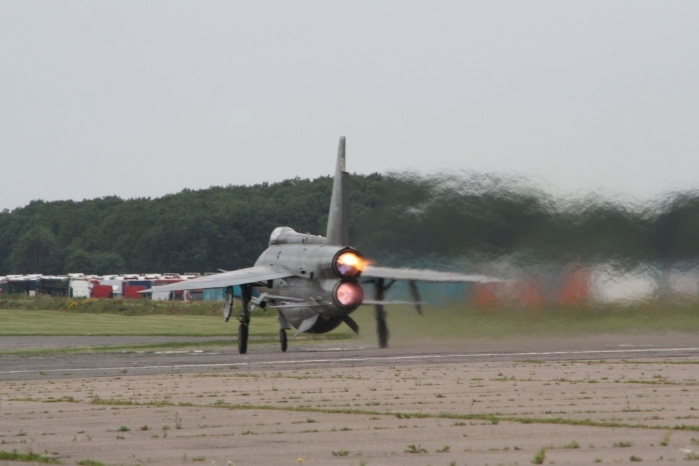 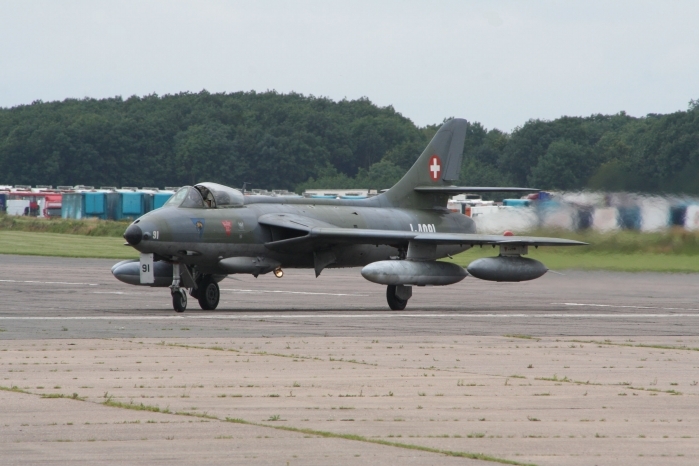 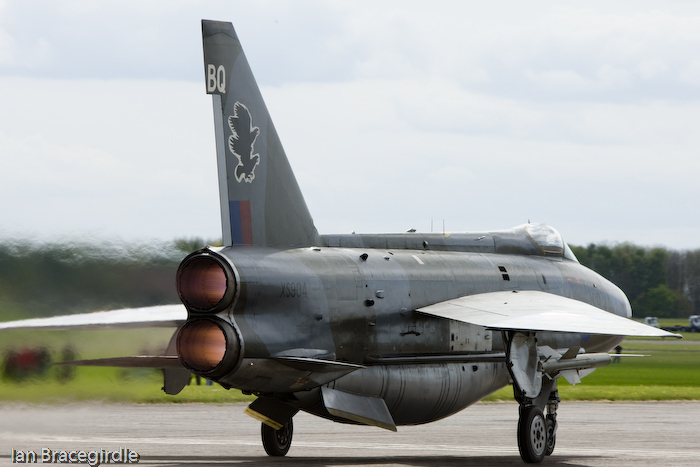 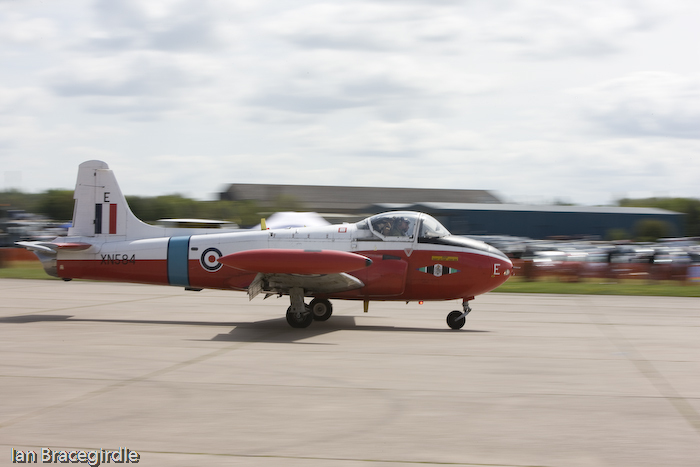 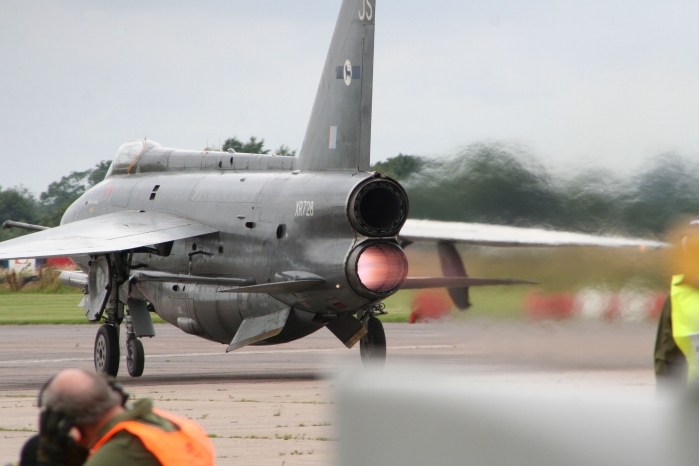 Shortly after both Lightnings were pulled out simultaneously and later in the afternoon Squadron Leader Dennis Brooks took XS904 up the runway for a full reheat fast taxi run. 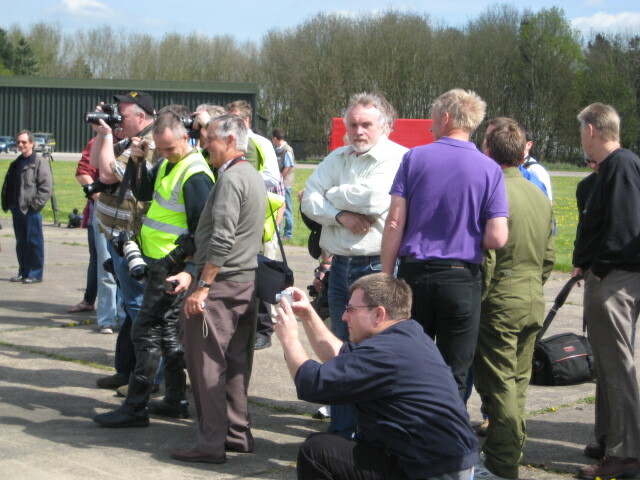 On Tuesday 27th April a small group of aviation enthusiasts and photographers eagerly awaited the arrival of Nimrod MR2 XV226. 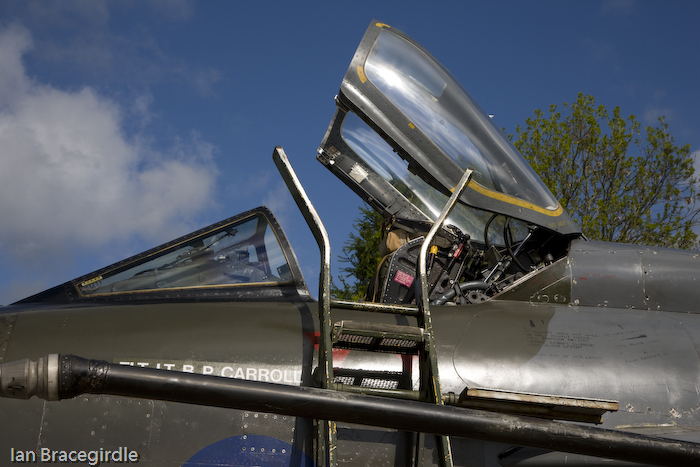 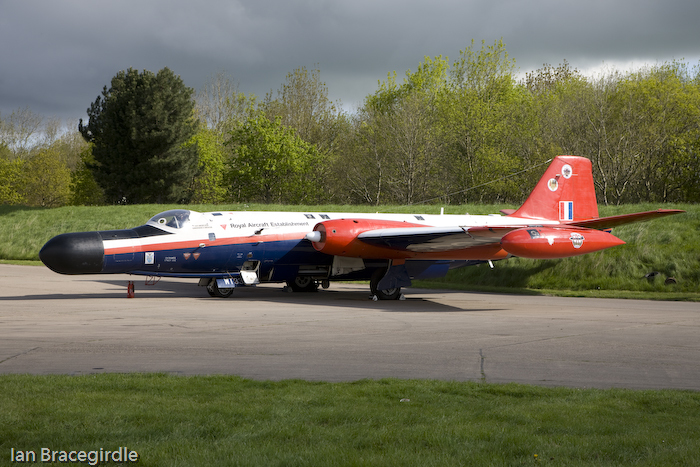 At 11:15am the aircraft appeared from behind the trees in what was near perfect weather conditions. 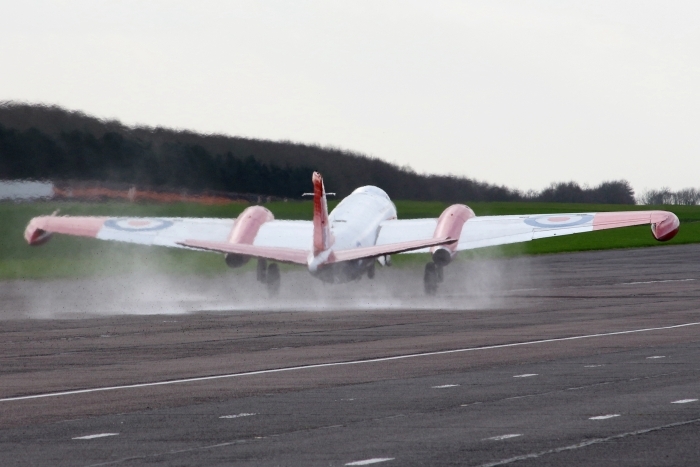 After carrying out a graceful run-and-break 226 carried out a roller along Bruntingthorpe's runway, before touching down for the very last time. 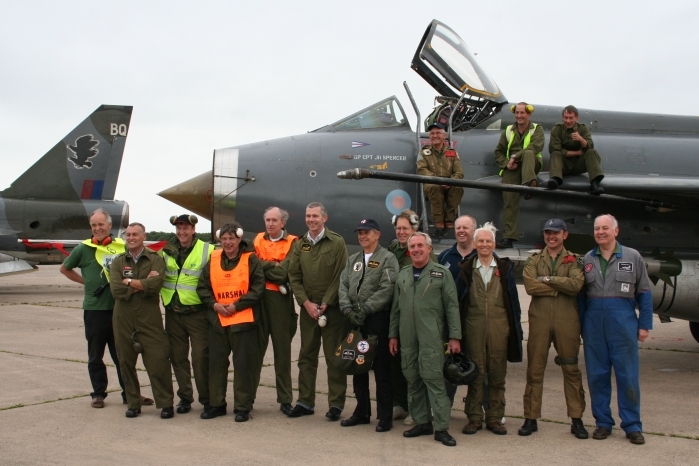 Having transited down from Scotland and saying a final farewell to Cottesmore on the way down, the Kinloss ground crew saw the aircraft in on one of Bruntingthorpe's dispersals. 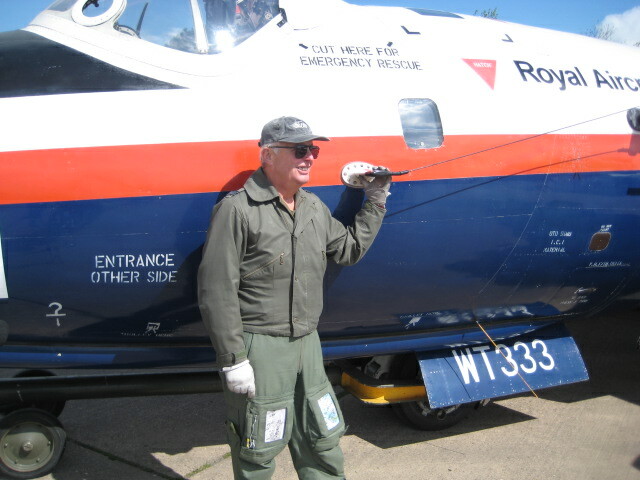 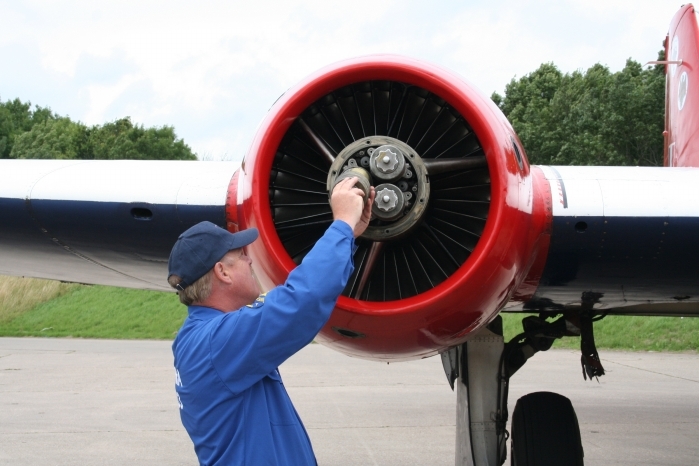 As her engines were shut down her new owner David Walton waited to greet the crew and receive the 700. 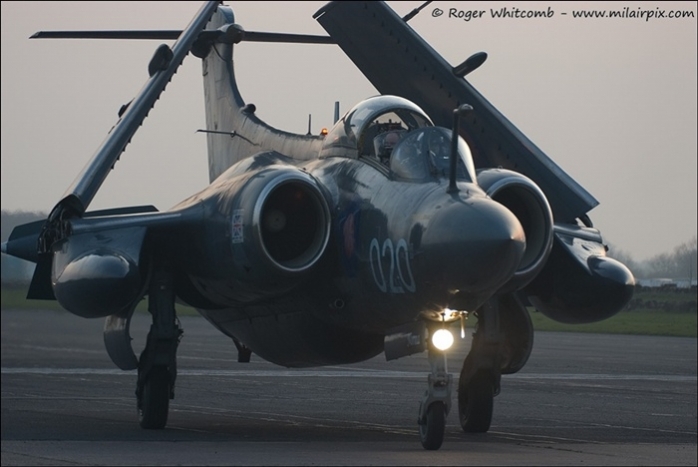 XV226 will be kept in ground running condition and should be joining the Victor, Comet and Lightnings for fast taxi runs very soon. 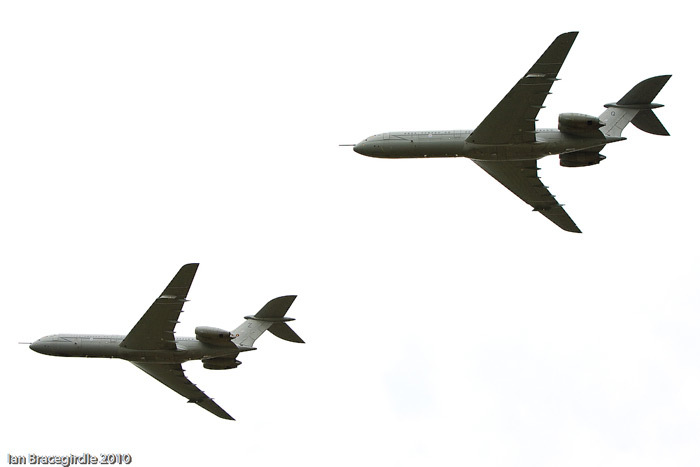 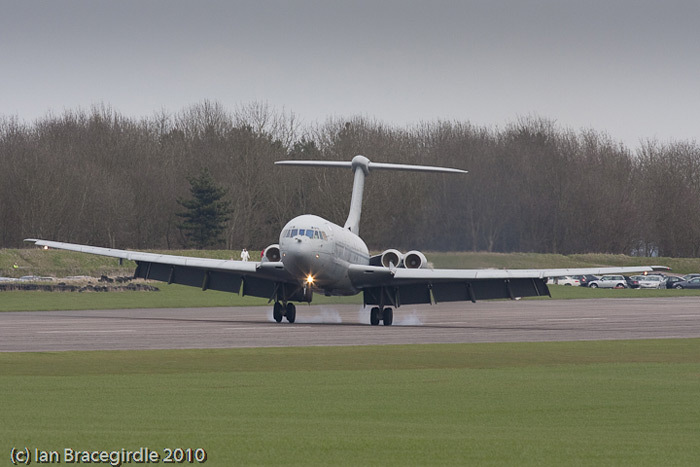 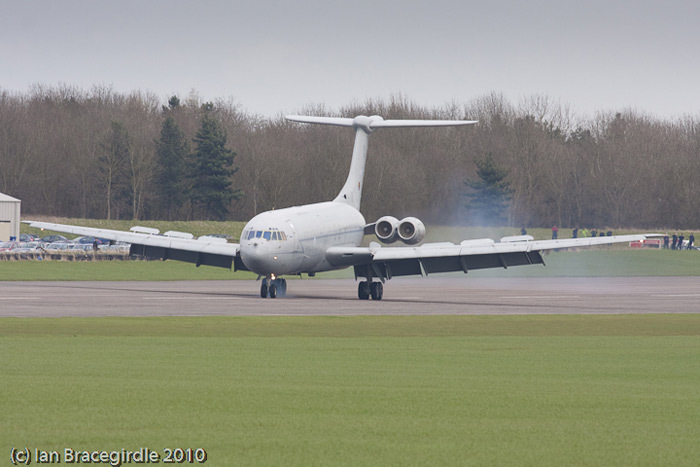 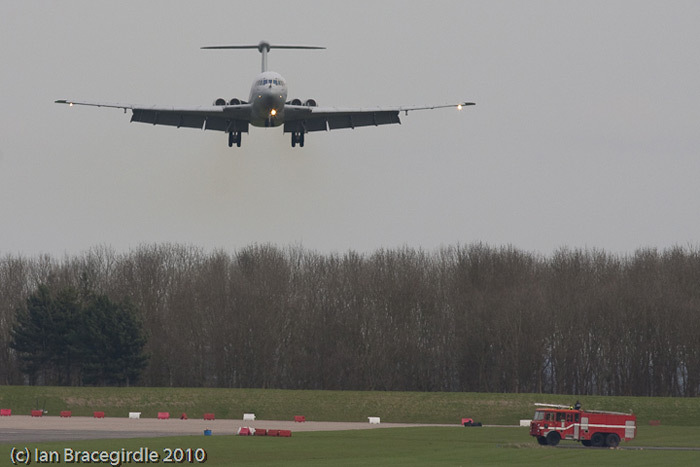 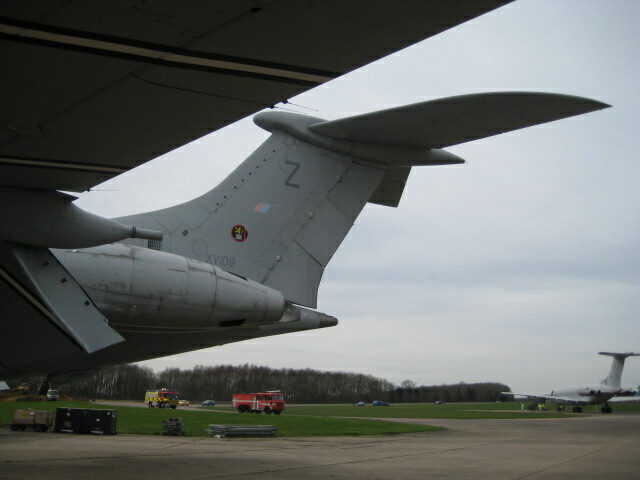 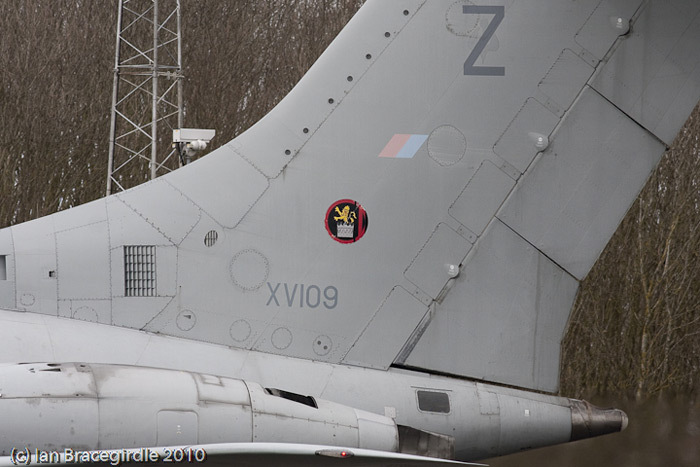 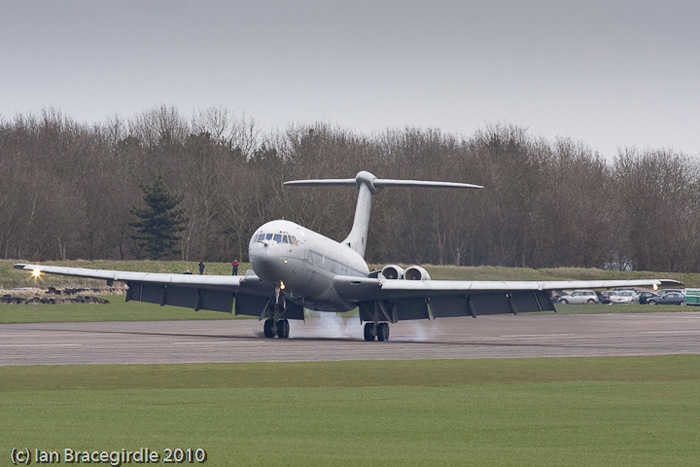 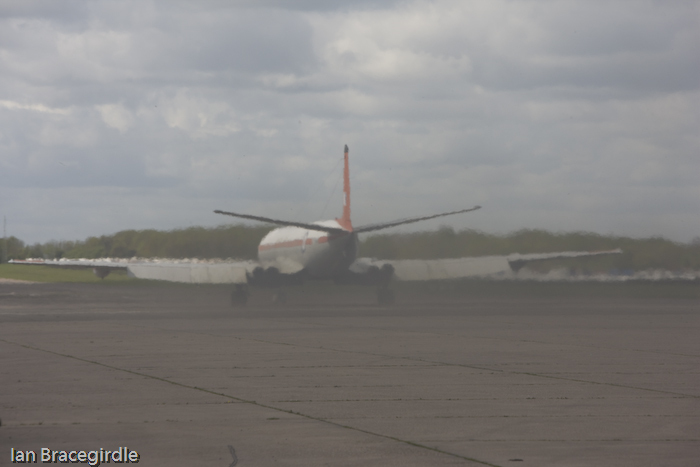 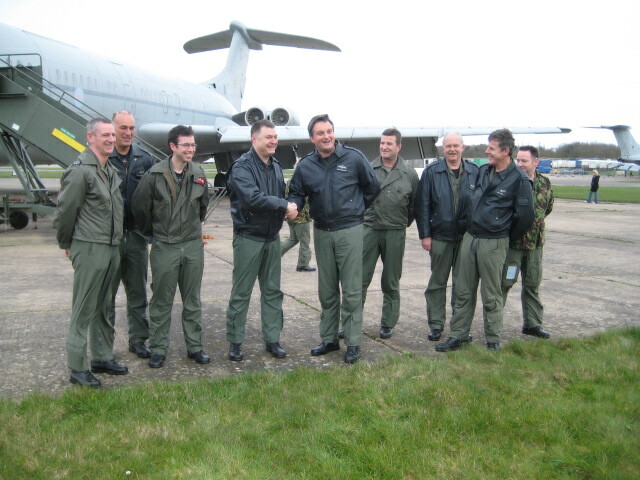 History was made at Bruntingthorpe on 6th April 2010 when two 101 Sqn VC10s made their final flights. 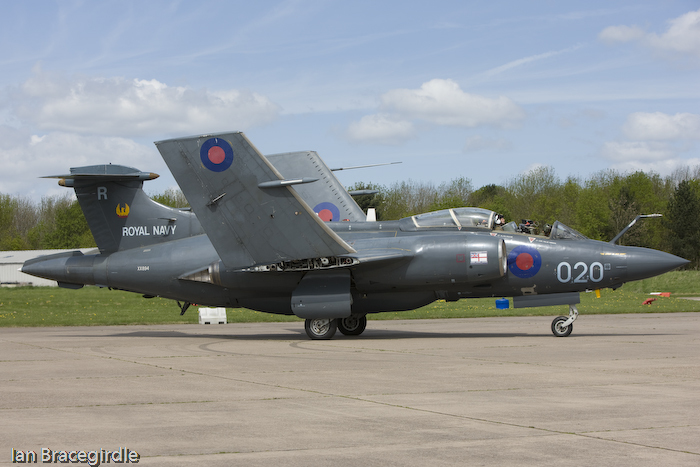 The aircraft XR807/Q and XV109/Z took off from RAF Brize Norton and did a final flypast before carrying out the short trip to Bruntingthorpe. 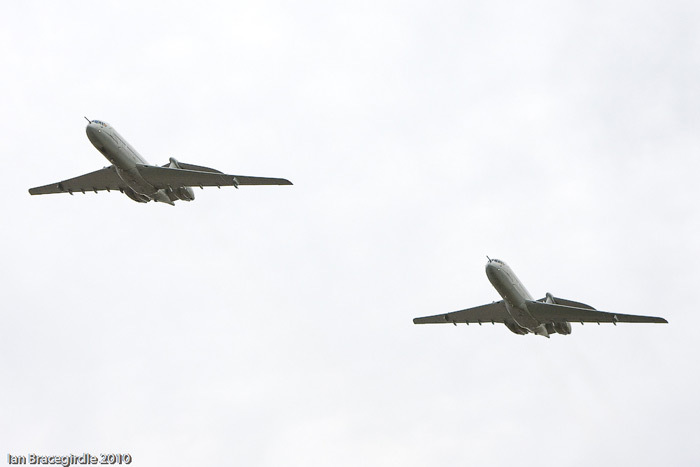 The aircraft carried out a two-ship flypast, breaking left and right before making their final landings. 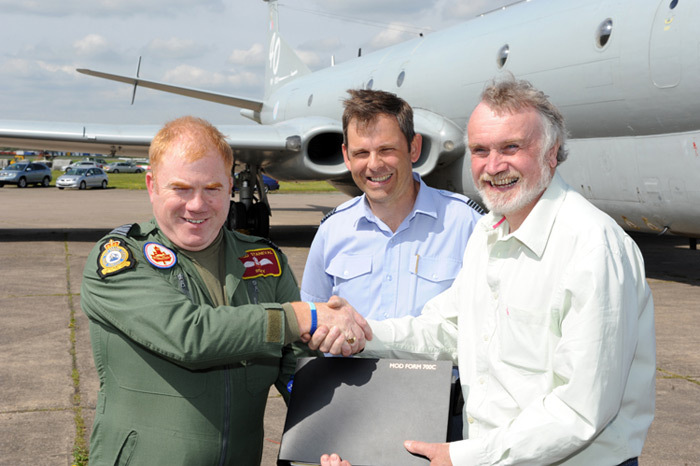 Between them they have given over eighty years of service and over 80,000 hours. 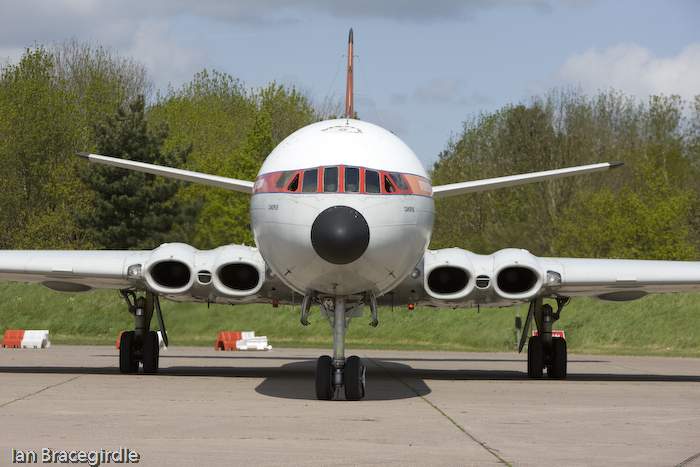 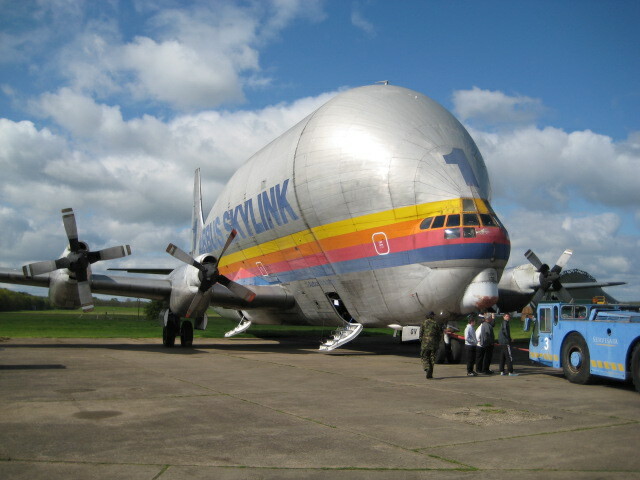 What a fine example of British design and engineering in what is one of the most graceful of large aircraft ever built. 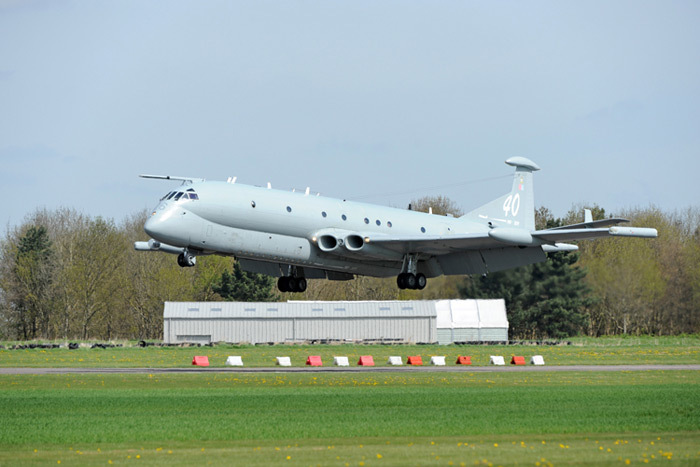 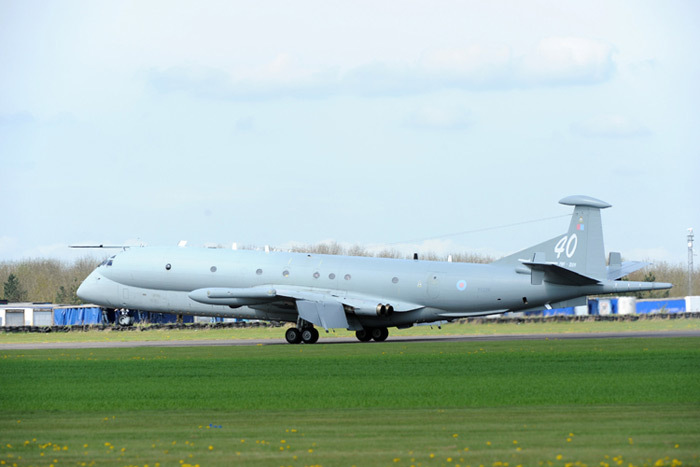 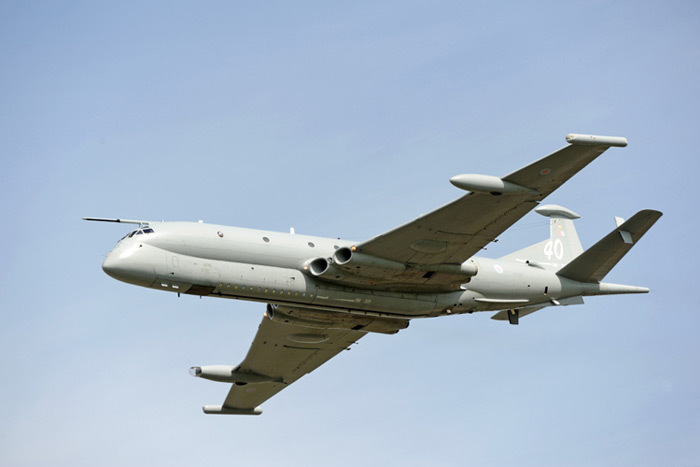 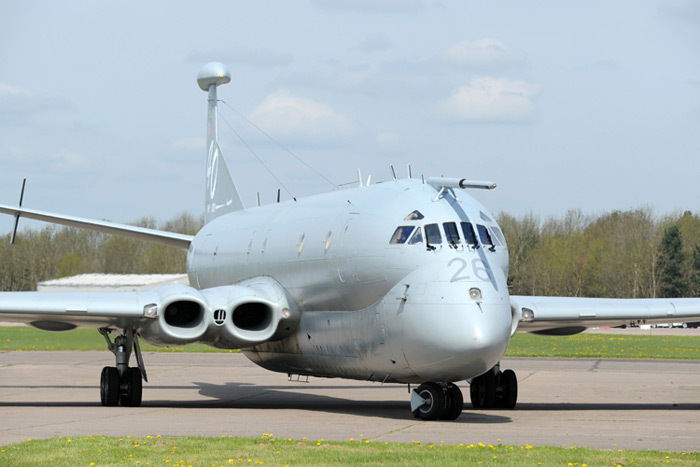 Thirteen VC10 tanker aircraft continue to operate from RAF Brize Norton, with some of the aircraft expected to soldier on until 2014. 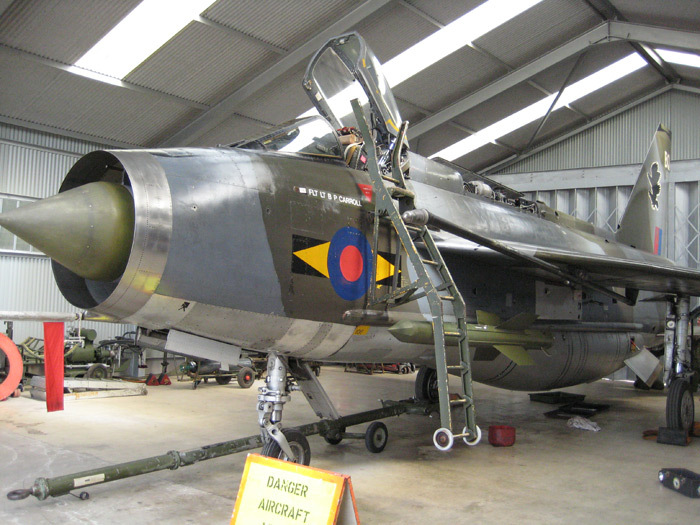 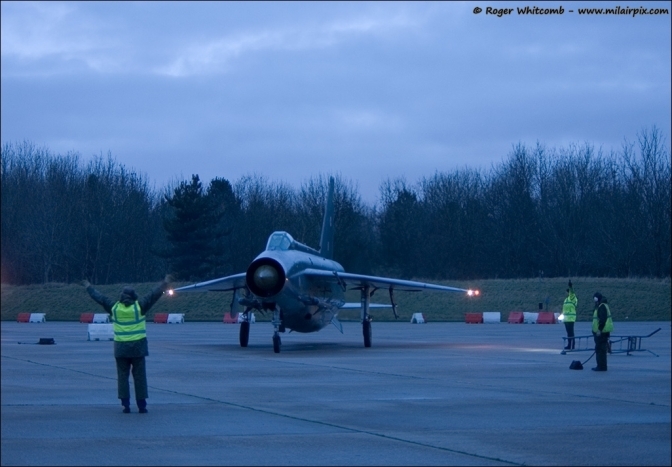 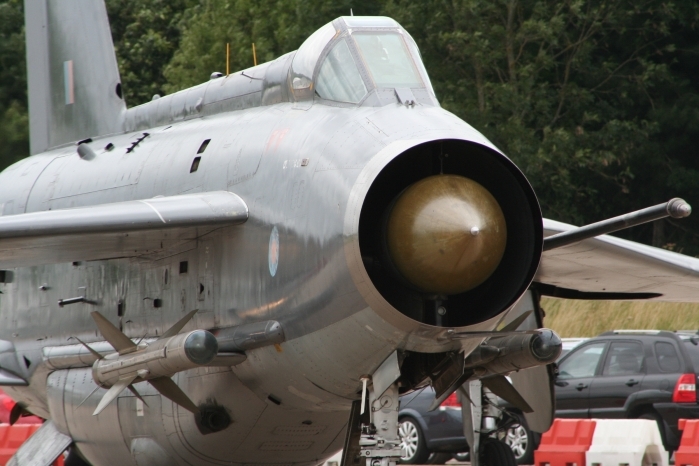 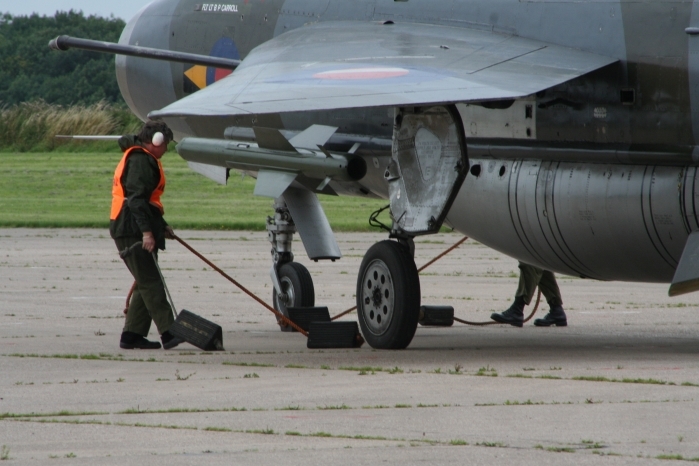 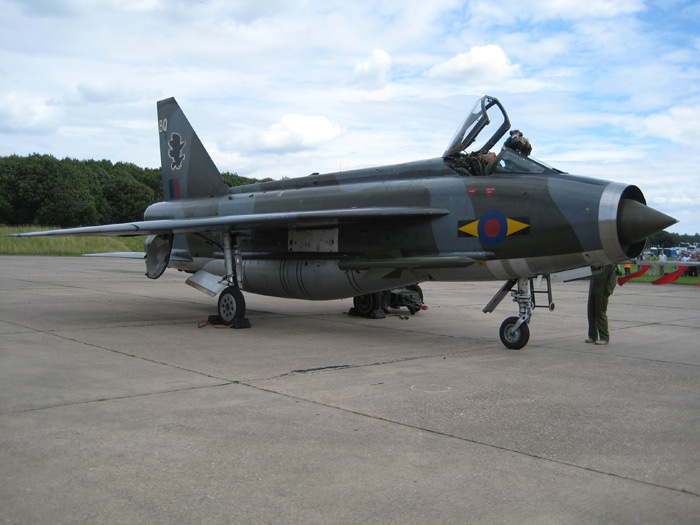 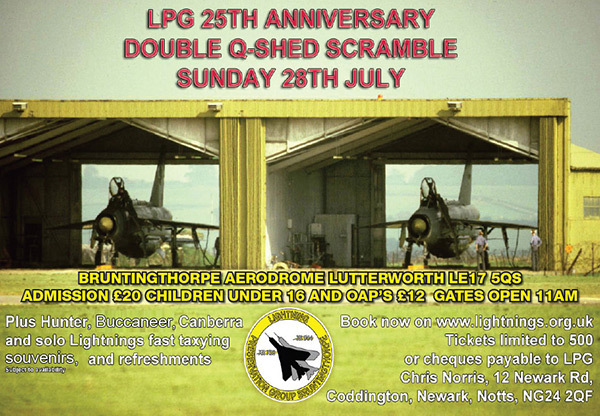 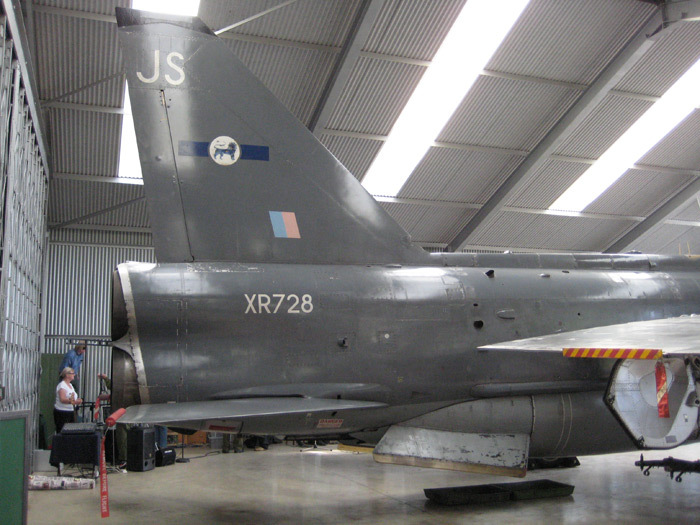 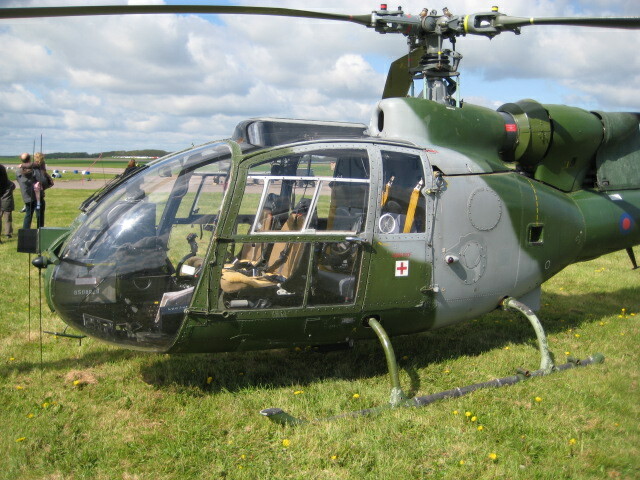 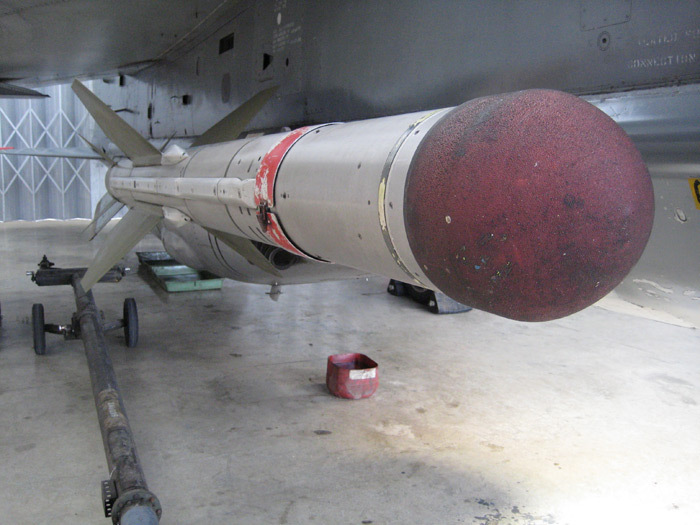 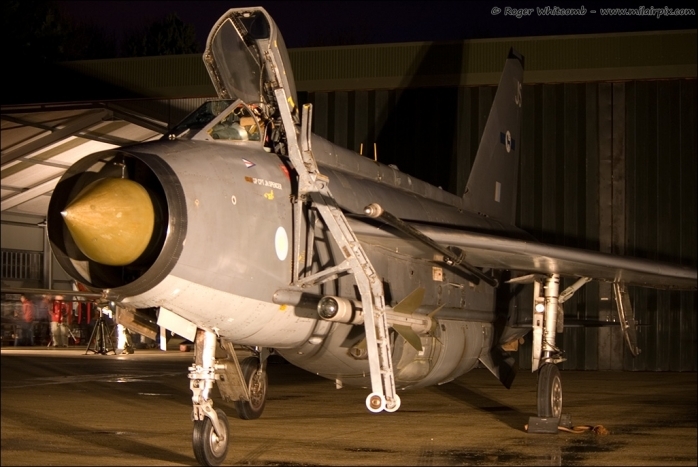 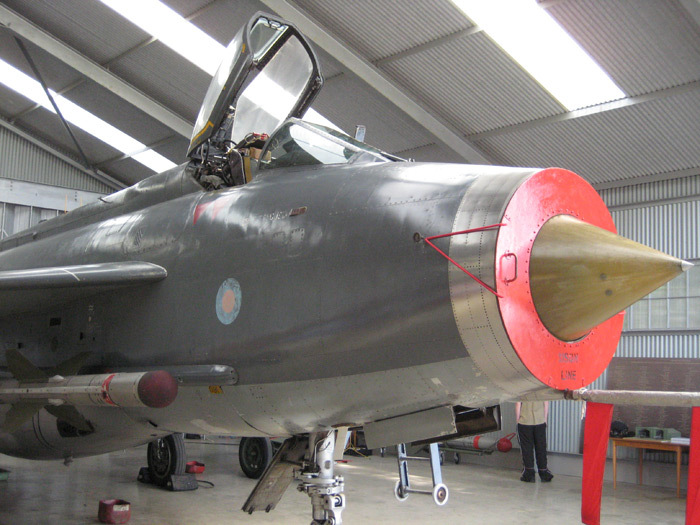 The Lightning Preservation Group (LPG) are raising funds to re-erect the former RAF Wattisham Quick Reaction Alert (QRA) hangar at Bruntingthorpe Airfield in Leicestershire. 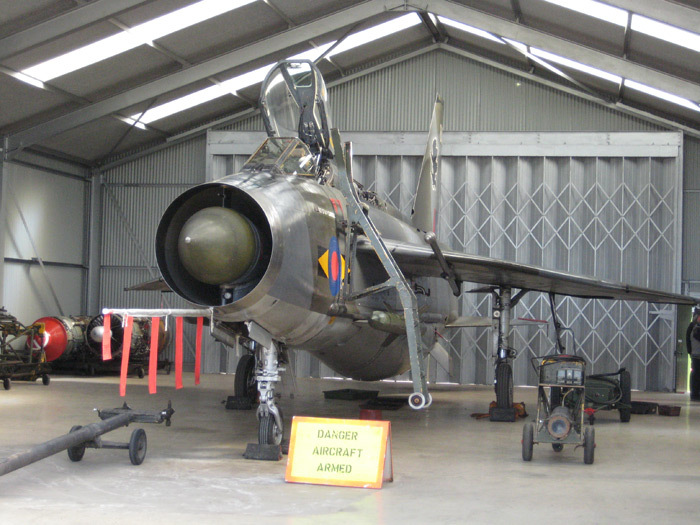 The hangar is historic in its own right, being one of only three built in the UK, it will protect both aircraft from the elements and serve as a unique museum and memorial to the "Lightning Force" and the Cold War period. £120,000 is needed to accomplish this aim, the fund currently stands at around £110,000. 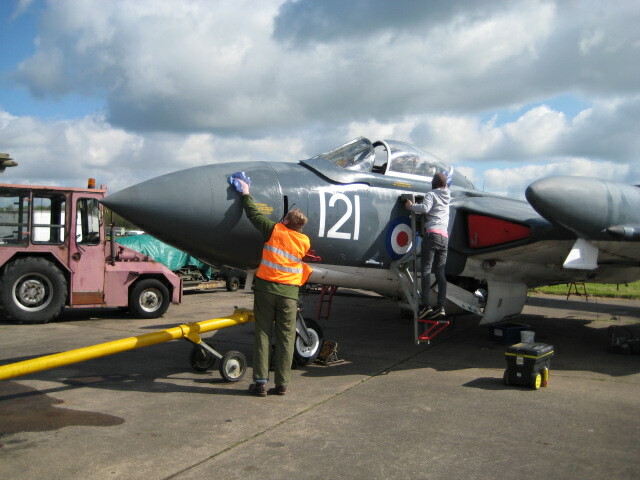 Re-erection work is almost complete! 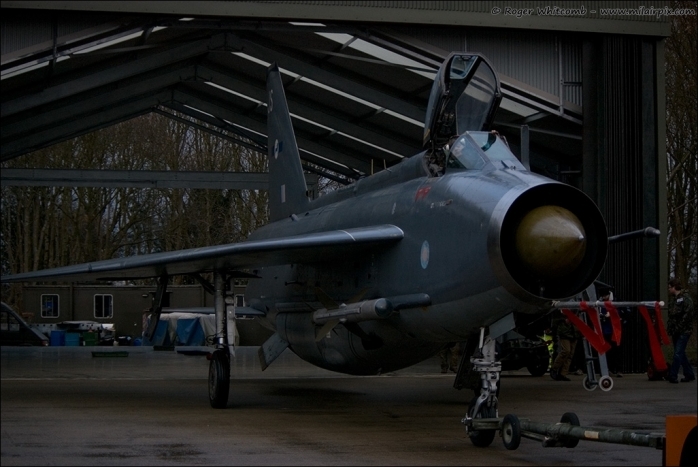 The steel work has been erected & the concrete floor finished! 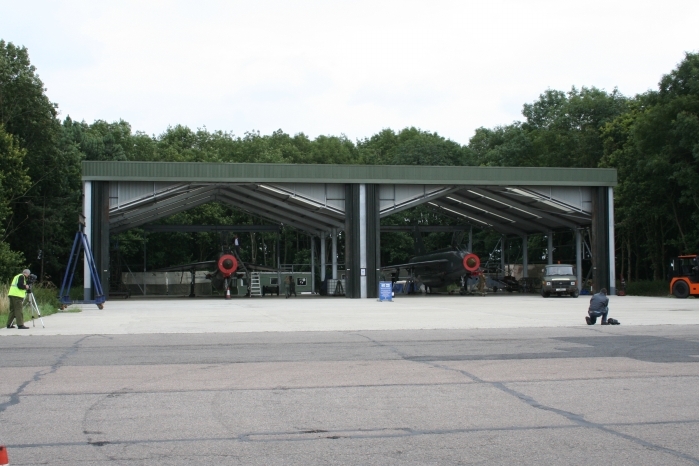 Roof cladding complete, front doors hung, side cladding on, just the back doors to complete and due to the latest Twilight Run there are now sufficient funds to hang the rear doors, after that there is just the rear cladding to complete. 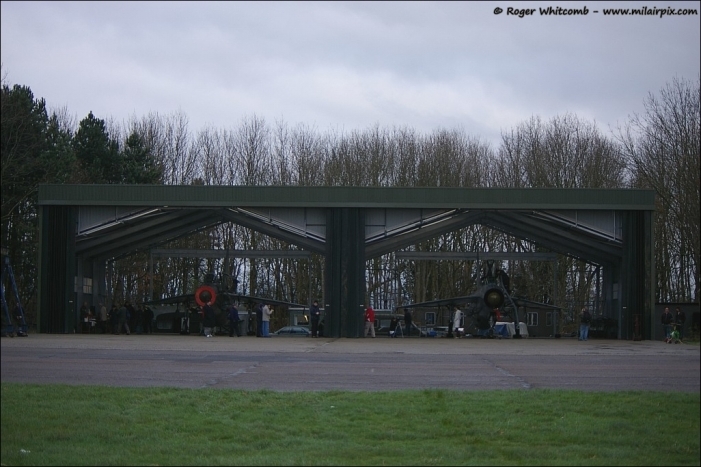 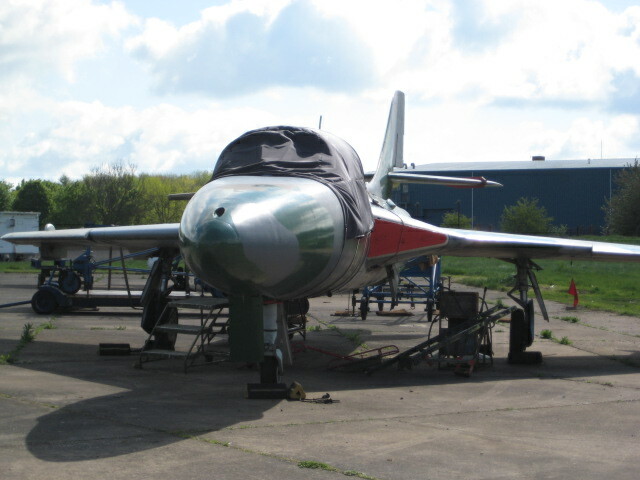 The "Q" shed (once finished) will form a unique museum of everything Lightning as well as stopping the aircraft deteriorating thereby keeping these historic aircraft serviceable and available for the public to enjoy.